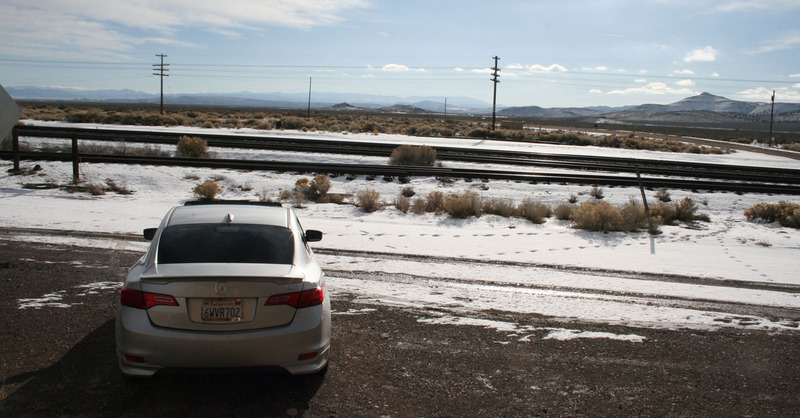 Dashing through the desert in a 201-horse, front-wheel-drive sleigh. That’s how I kicked off my weekend on Friday after work. 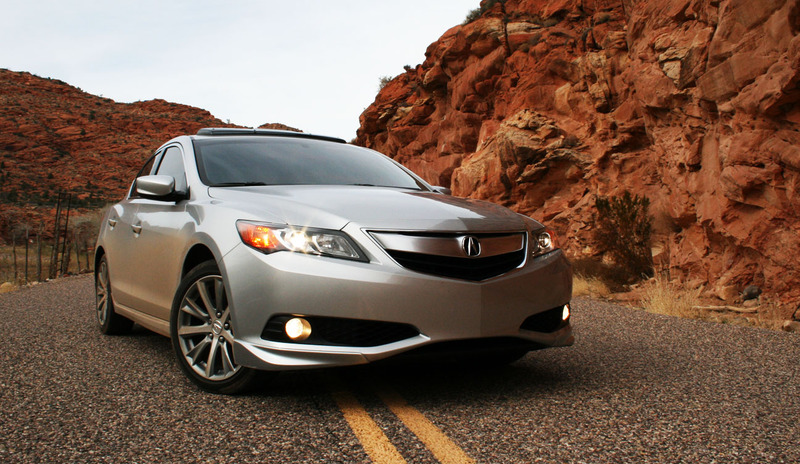 When I wasn’t spending time with family or friends, I was behind the wheel of the Acura ILX over the last few days. Here are the details of my travels! 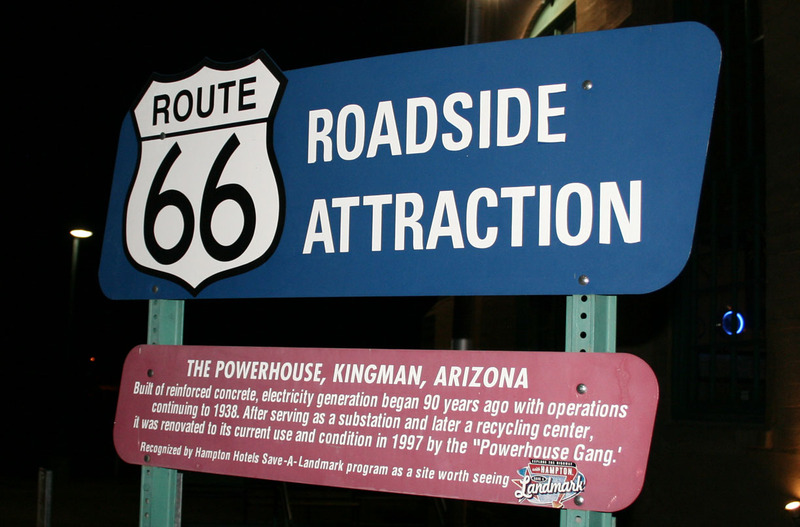 About 3 hours (200 miles) into my drive, I stopped for a little Route 66 side-trip in Kingman, Arizona. 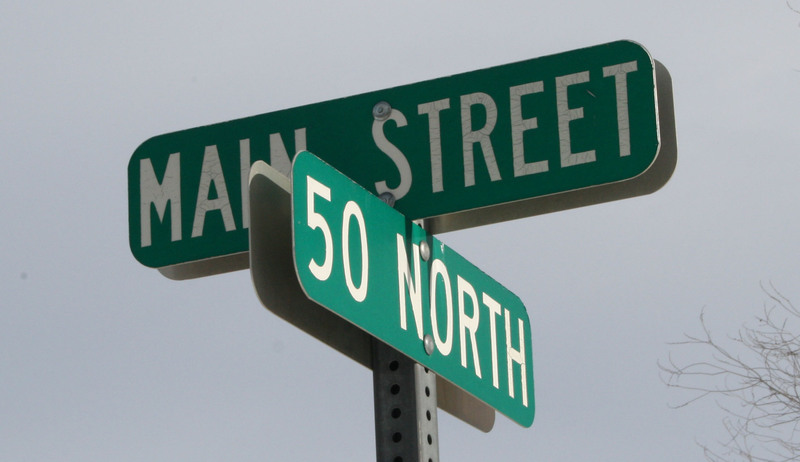 The original highway, now bypassed by Interstate 40, is called Andy Devine Road. Even though it was after-hours, I made my way to the Visitor’s Center (which used to be the city’s power plant, thus is now named Powerhouse Museum). 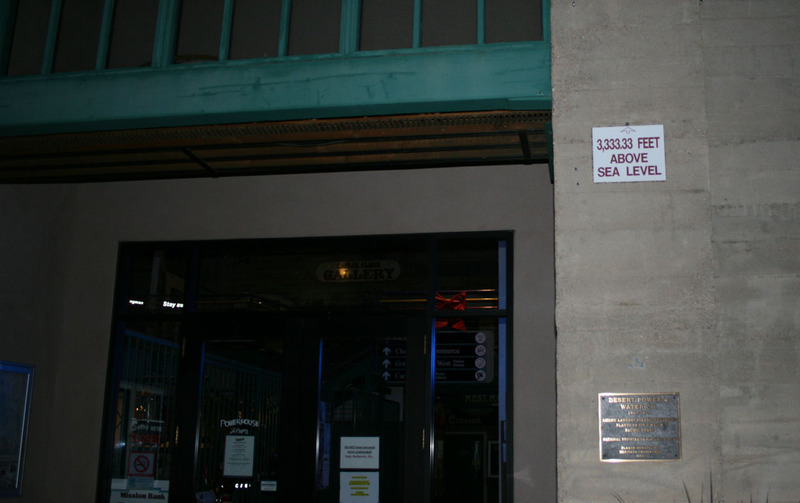 There’s a marker here that denotes the site’s elevation: 3,333.3 feet above sea level. A spike in the building denotes the exact location. I circled the location of the sign in red here, on the building behind the ILX. Photoshop skills at their finest. 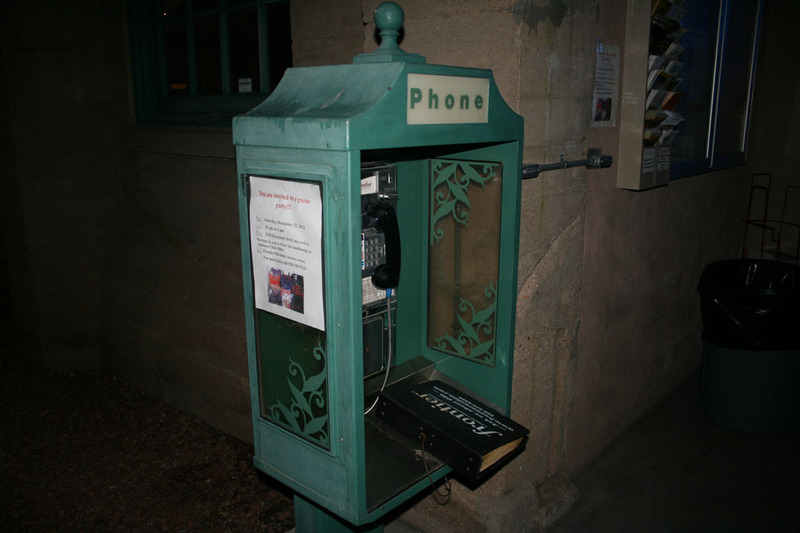 When was the last time you saw a pay phone? Better yet, when was the last time you USED one? Across the street, a 1928 steam locomotive was on display. 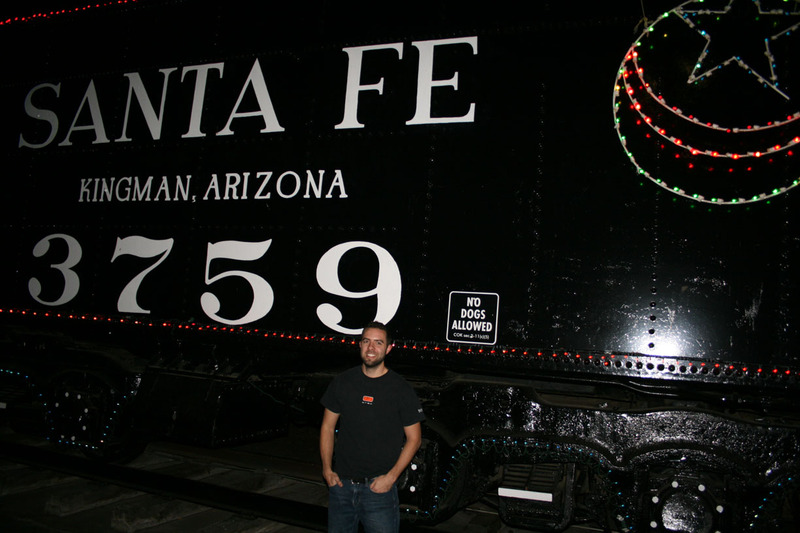 This one was Santa Fe #3759 – a “4-8-4” style that was built in 1928 and ran until 1957 when it was donated to the city of Kingman. 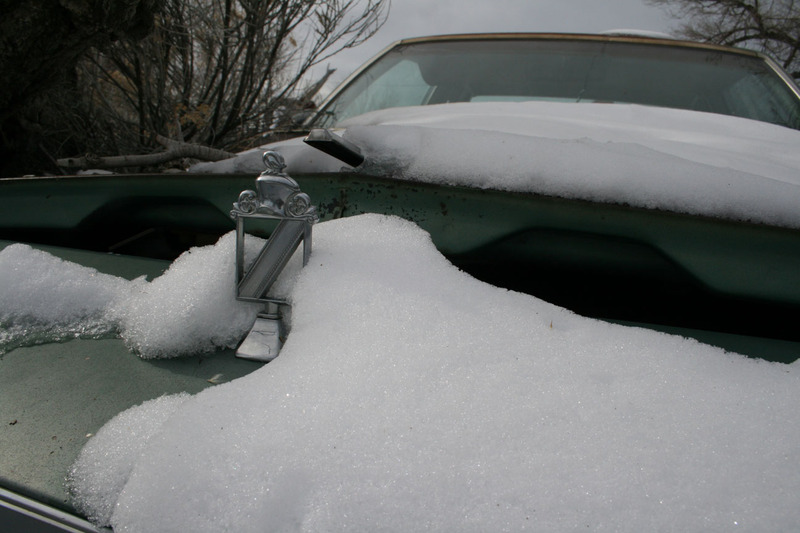 It’s sat in its current location for 55 years! The locomotive reportedly ran 2.5 million miles of service before its retirement. Now that’s something a half-million miler like me can appreciate! 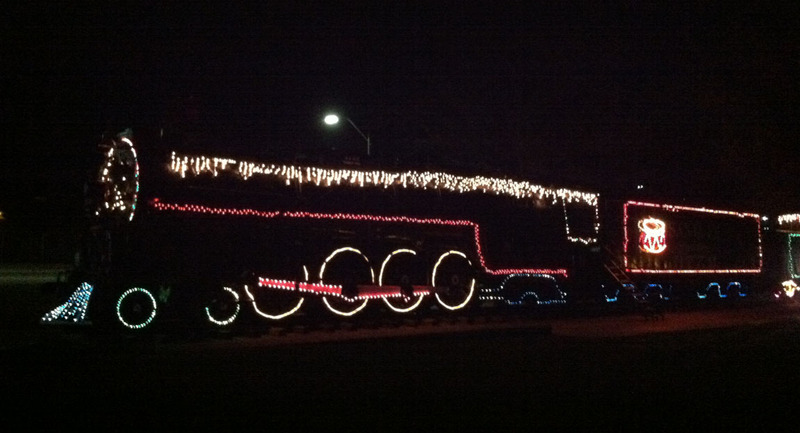 Each year during this season the train is decorated with Christmas lights so I got a few pictures before continuing on my way. In Las Vegas I met up with Drive to Five fan Jessie, who is a proud Legend owner. His Rosewood Brown 1992 L Sedan automatic has only 134,000 miles on the odometer. Jessie strives to keep his car running in tip-top shape. I was privileged to take it for a drive around the parking lot. Hike time! 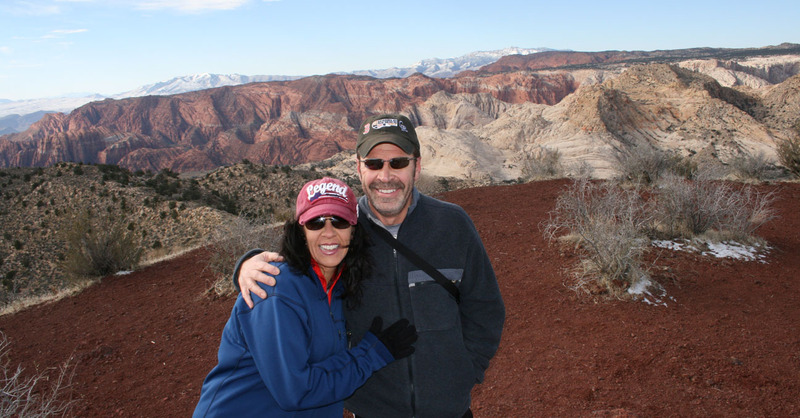 On a cool (30-degree), crisp Saturday morning I picked up my mom, my stepdad, and our friend Holly for a trip up to Snow Canyon State Park by following State Route 18 which leads north from the St. George area. 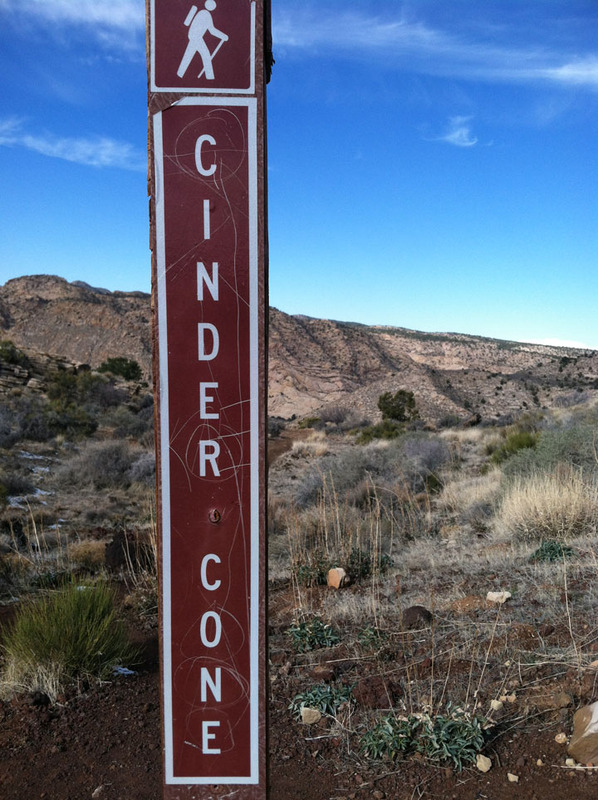 About 10 miles up the road, we arrived at the trailhead for the Cinder Cone hike. The hike itself was only 3/4 of a mile long each way, but it traverses some rocky / jagged terrain and ascends about 500 feet in elevation. Reassurance marker along the way, though trail was clearly visible. 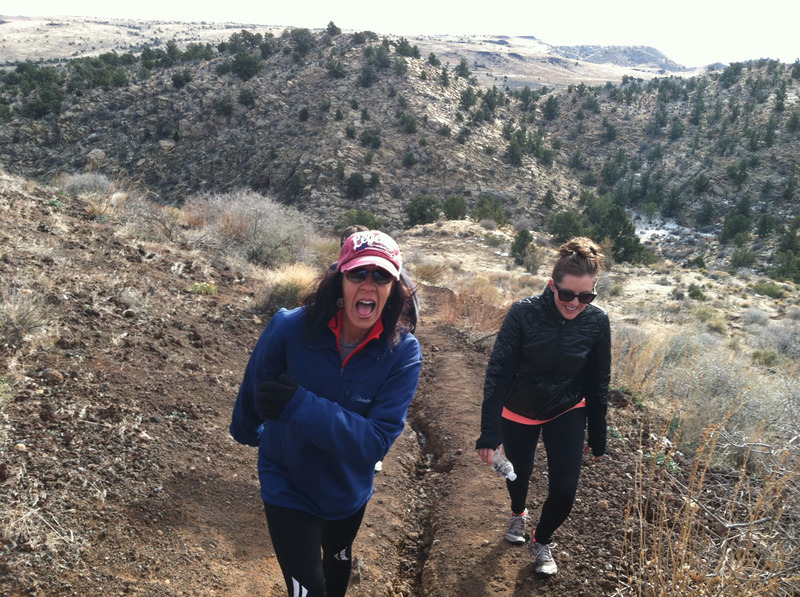 Last stretch before reaching the summit. Freezing but still celebrating our arrival at the top. The views from the top are spectacular. 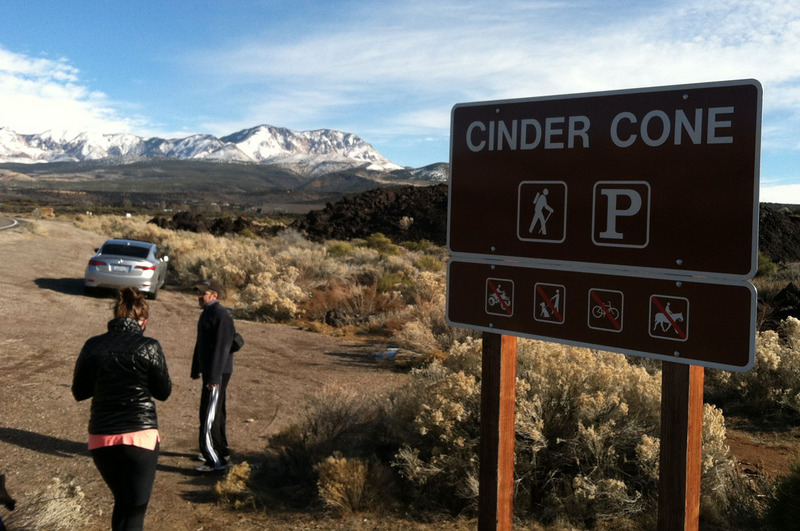 Since Cinder Cone is an ancient (and now extinct) volcano, from the summit, the crater is still visible. 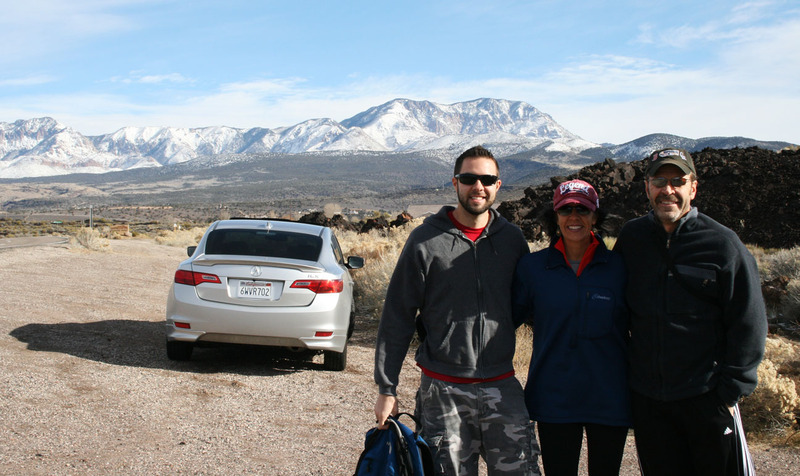 Our descent went much more quickly and we soon enjoyed the comfort of the ILX and its heated seats to take us back to St. George. 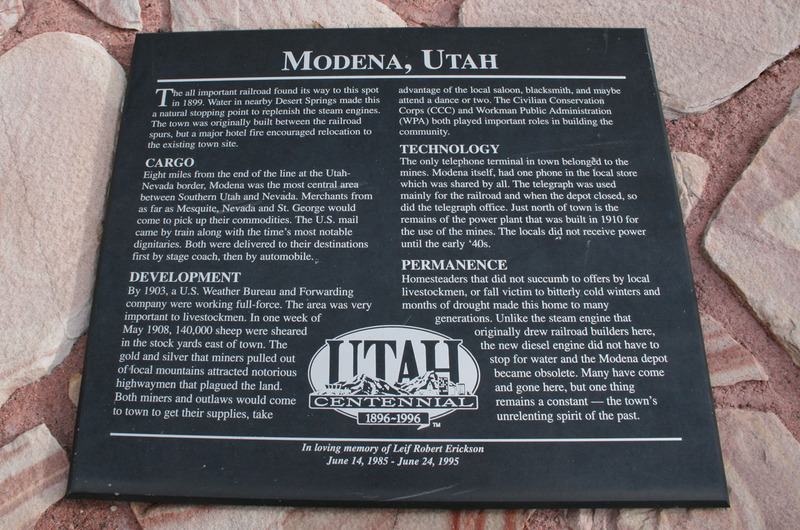 Modena, Utah. 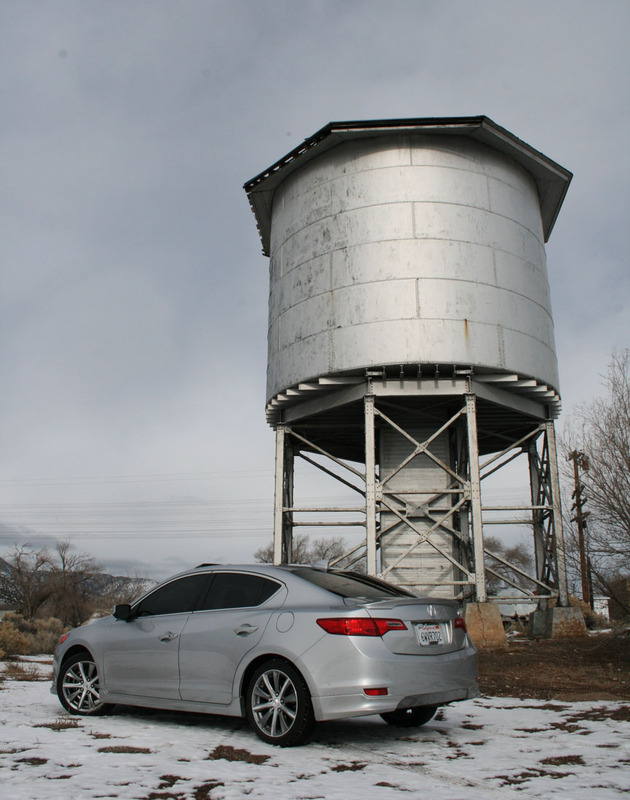 It’s a town that I visited 7 1/2 years ago in my then-175,000 mile Acura Legend. I felt like giving it another look to see what’s changed. As it turns out, aside from a few more years of aging, it sits largely the same as it did in 2005. 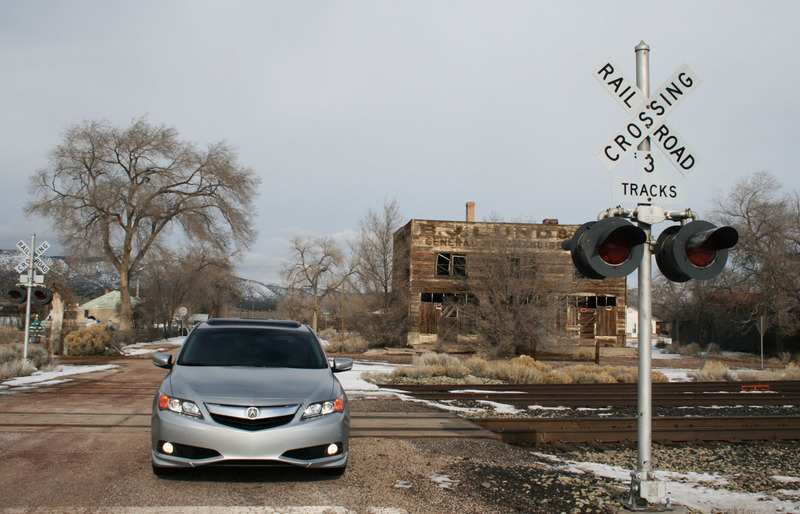 On a crisp Sunday morning I headed out from St. George Utah via State Route 18 to explore some of southwest Utah’s backroads in the ILX. Total distance was about 170 miles round-trip. 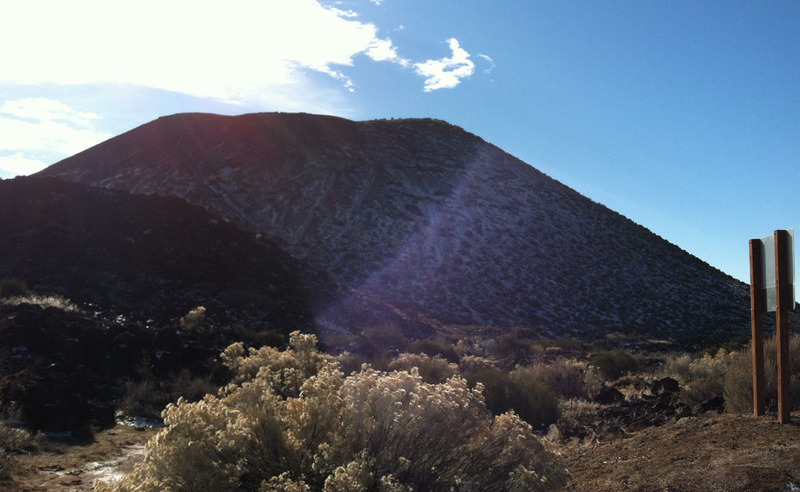 As I began my climb to the higher elevations, I started seeing white-capped mountains in the distance. 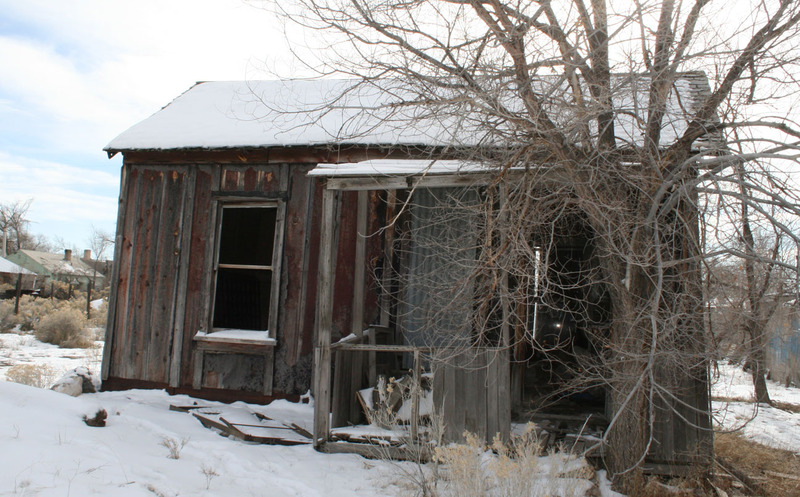 Soon I was passing through Veyo, Utah (population of 483 people as of the 2010 census). 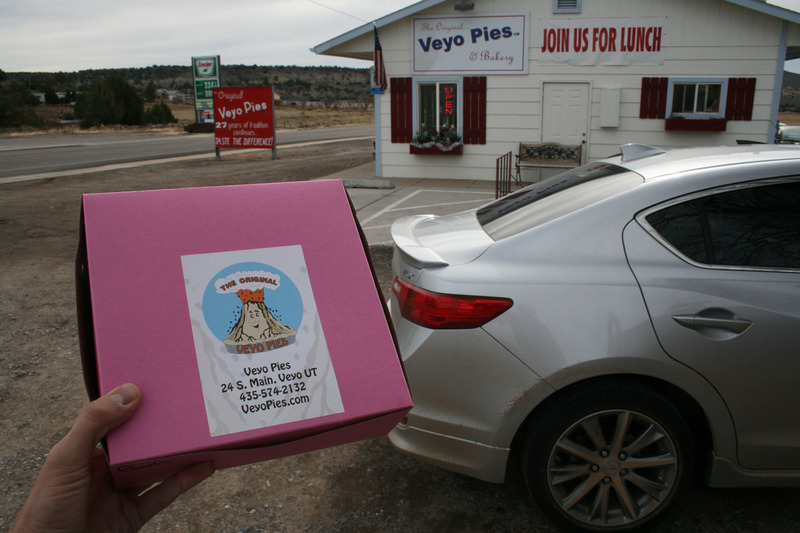 This giant red sign advertising Veyo’s famous pies caught my eye on the roadside. More on that later! 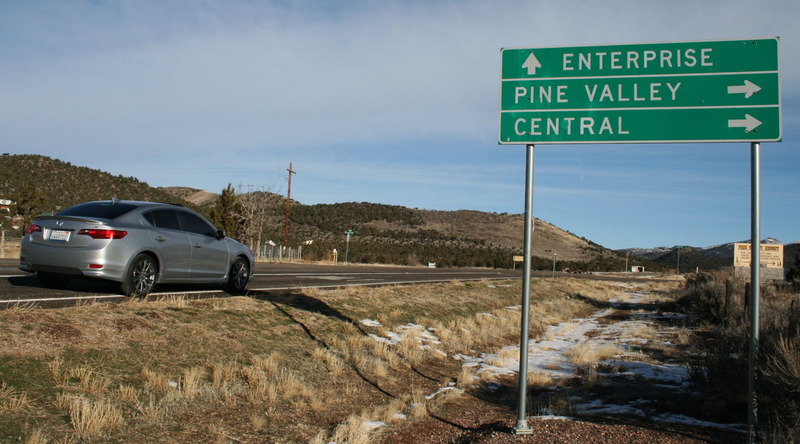 I decided to take an 8-mile detour to the east to visit a tiny town called Pine Valley. 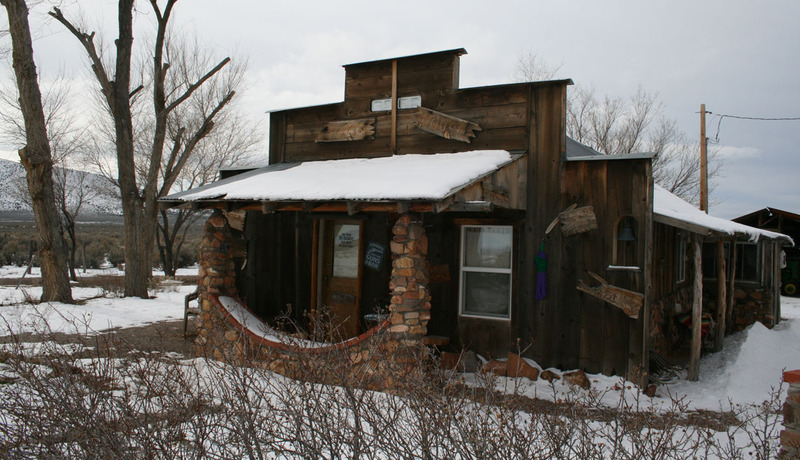 This place is a popular cabin destination for folks in St. George who want to escape the triple-digit temperatures during the summer months. 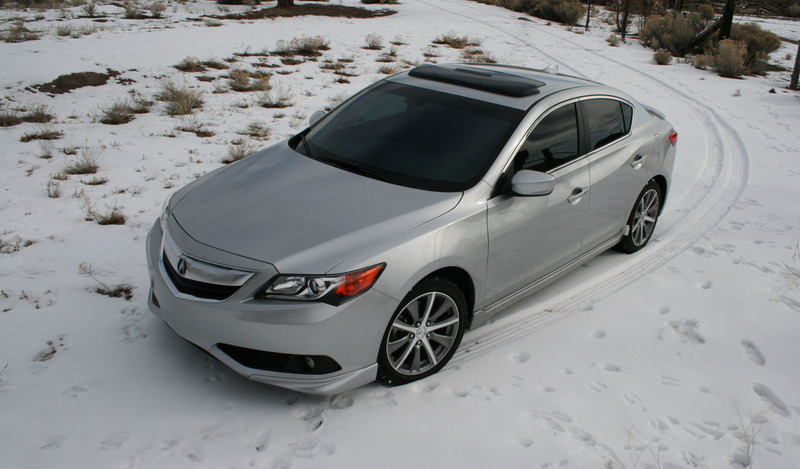 This was the first time my ILX had seen snow, so I pulled off for a quick picture. 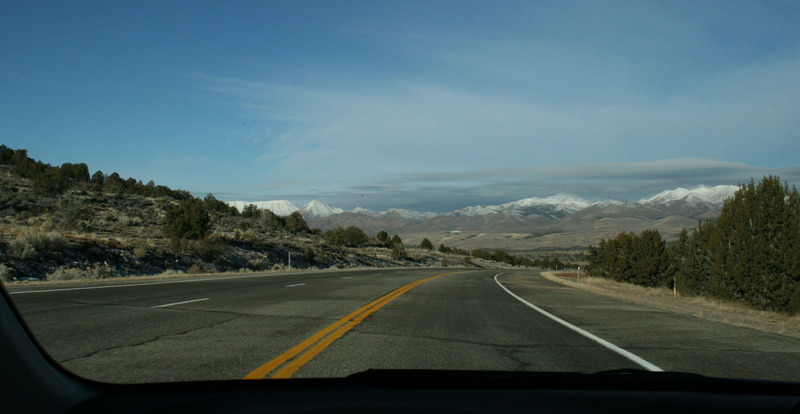 Arriving in Pine Valley via Grass Valley Road. 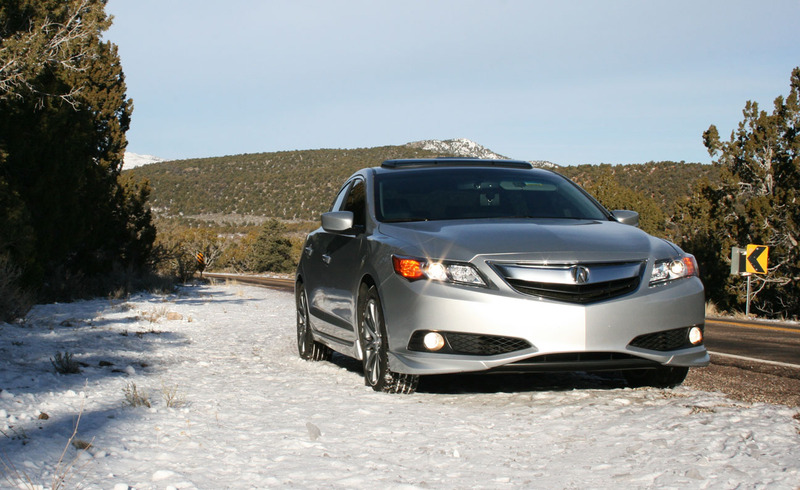 It was a crisp 27 degrees Fahrenheit according to the ILX’s exterior temperature readout. 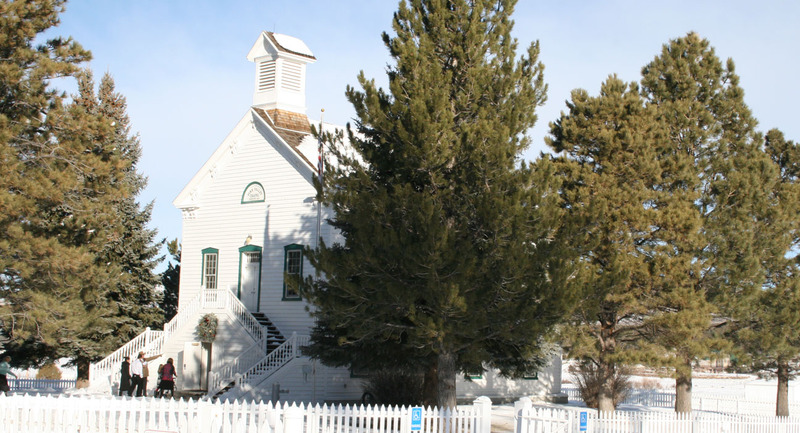 I got a picture of the Pine Valley Mormon chapel, which was just starting to welcome its guests for the 10:00 a.m. Sunday service. This chapel was built in 1868 by Ebenezer Bryce, who used the scheme of an upside-down boat. Today, it’s the oldest continuously-used Mormon meetinghouse. 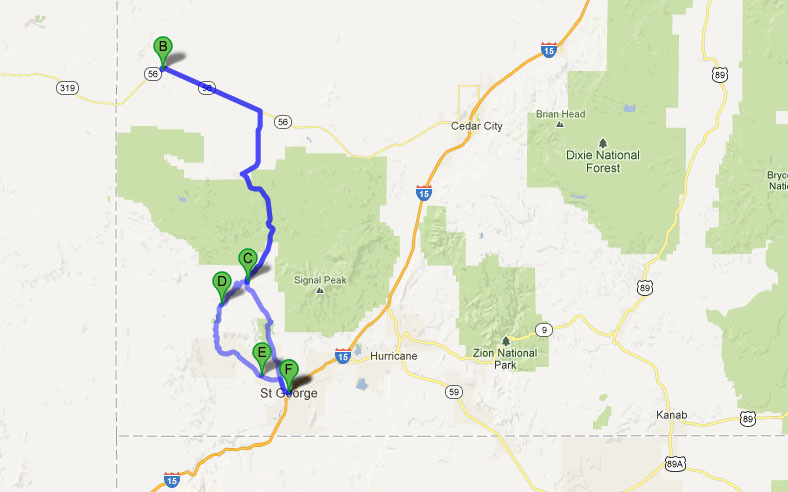 Next it was time to loop back to SR-18 and continue northward. 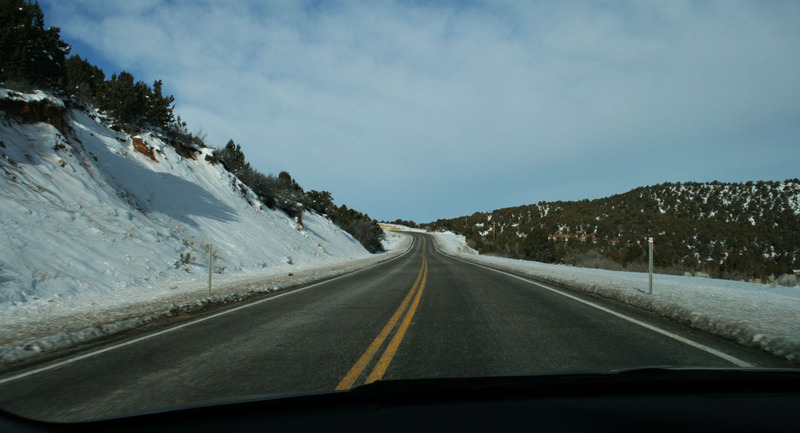 The summit on this road is elevation 6,150 feet. 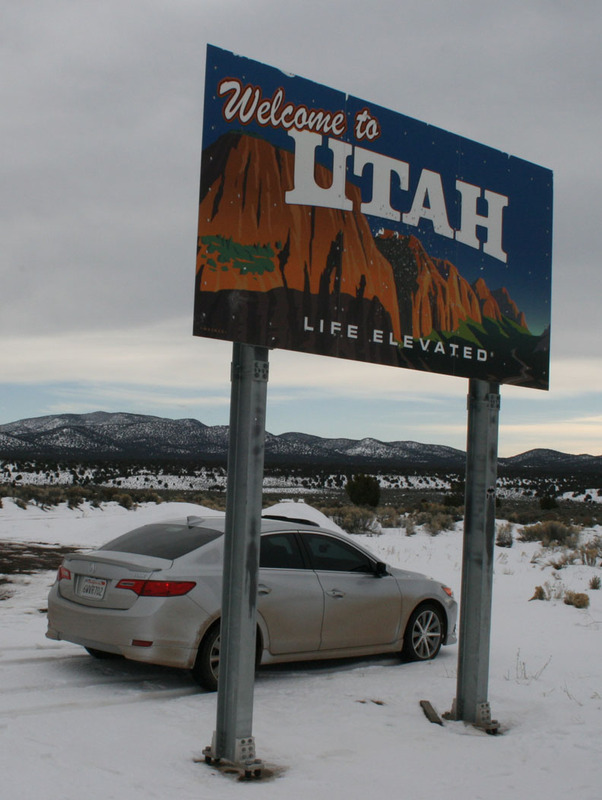 At Enterprise, Utah, I veered right to stay on SR-18 for another 15 miles or so. Closing in on my destination! 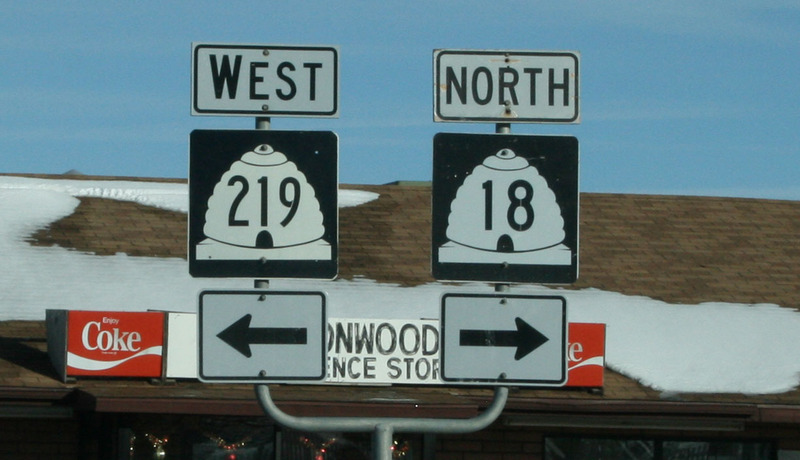 From the intersection of SR-18 at Beryl Junction, Modena lies another 16 miles west. 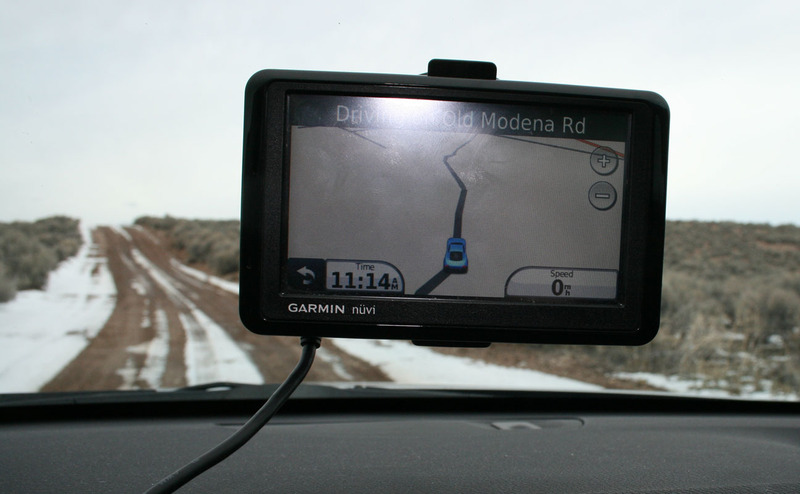 During this 16-mile stretch, I counted only two other vehicles that I encountered. 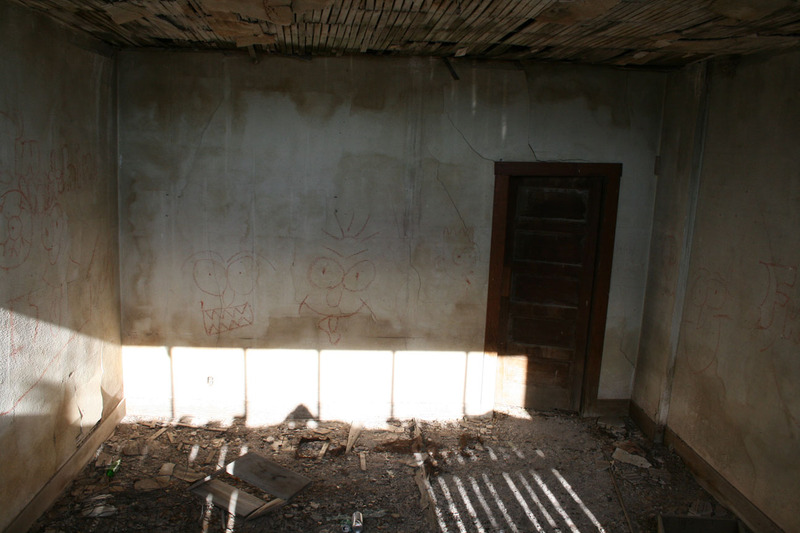 This is an extremely remote location! 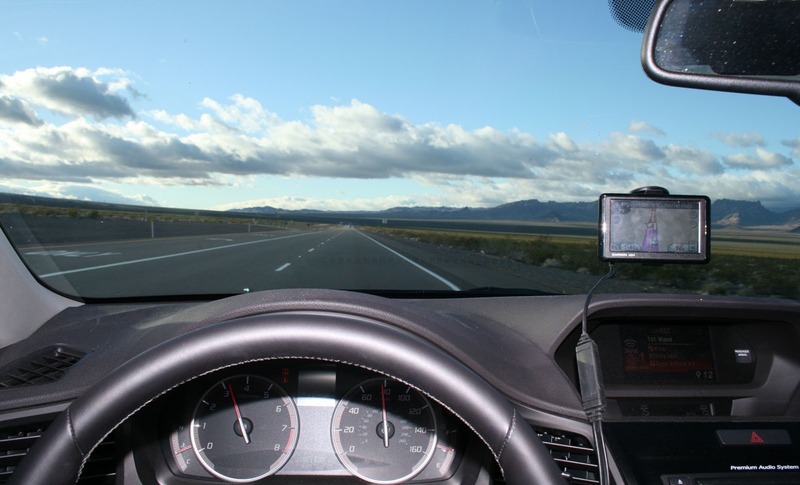 Speed limits are 60 mph which seems agonizingly slow for the wide open stretches. Unfortunately, the Last Chance Saloon is no longer open for business. I would have loved a bite to eat. 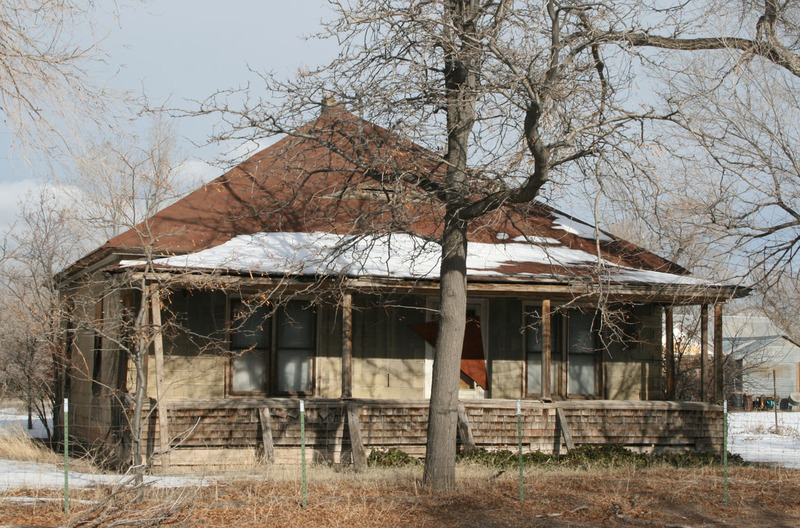 “With the advent of the railroad in Iron County and its arrival in the Modena area in December 1899, Brigham J. Lund, along with two partners, E. M. Brown and Jose Price, started a small business venture here. In time they were freighting to St. George, Utah; Pioche, Nevada and Delamar. Lund soon bought out his partners and in 1903 incorporated under the name of B. J. Lund & Company. 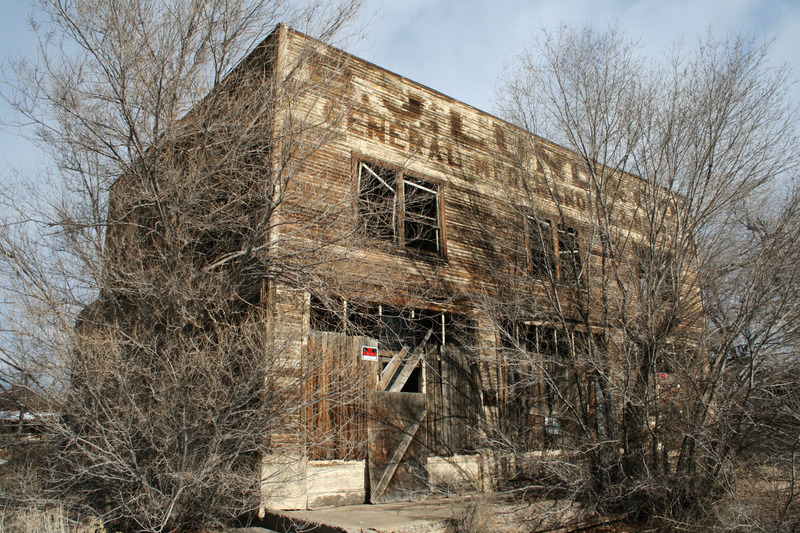 The name “Lund” is still found on several buildings in town including the General Merchandise & Hotel building. By 1903, a U.S. Weather Bureau office had also been established in Modena. The Last Chance Saloon now closed and boarded up is a reminder of a distant era. 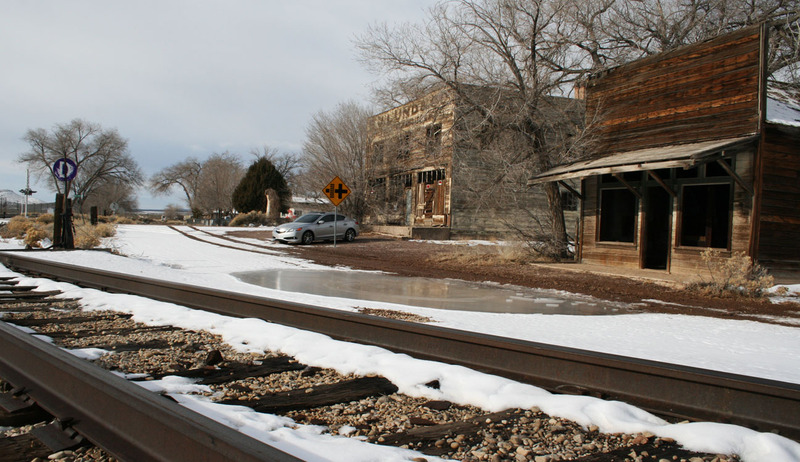 The change from steam to diesel by the railroad brought about the demise of Modena which today is almost a ghost town. Only five families remain. 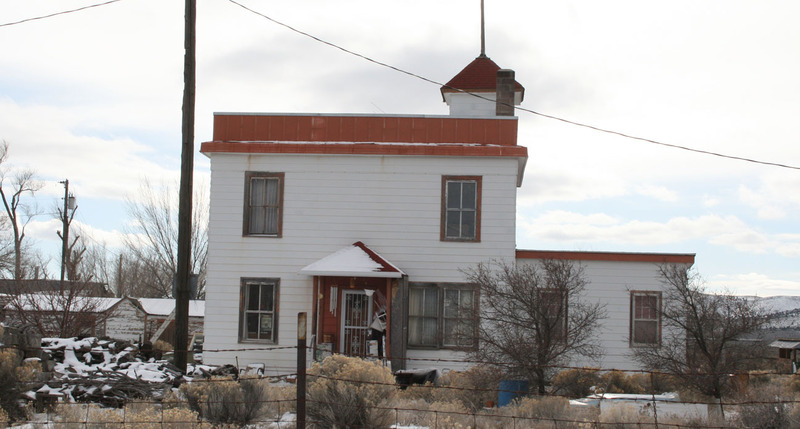 There is a small convenience store/post office and a gas pump (no services available as of this writing) in town which served locals and others working the silver, iron ore, and beryl rock mines around the area. 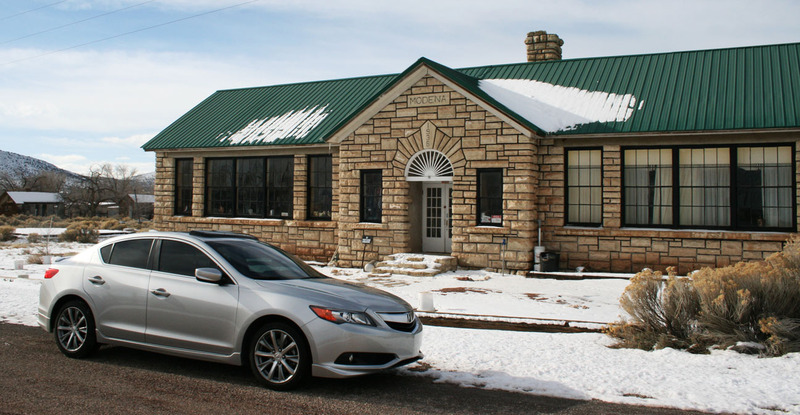 A stone school building is one of the more imposing solid structures in town. Edna Thorley 91, taught elementary school children in the building. She still lives in town and keeps up scrapbooks filled with memories of the past and present. Just north of town is the Modena cemetery. B.J. 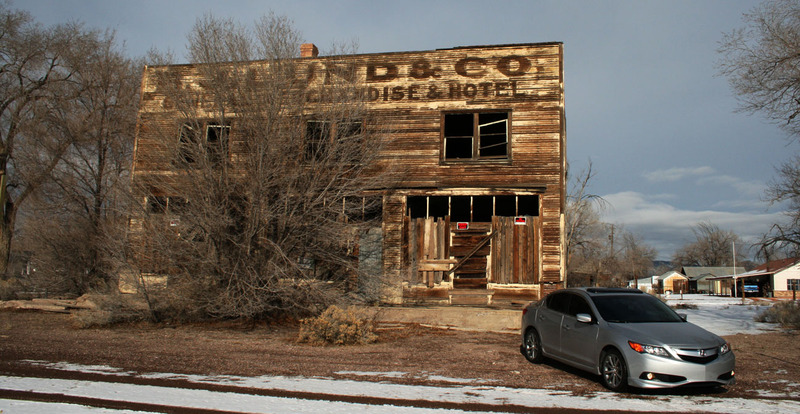 Lund & Co: General Merchandise & Hotel. This place has been around for over 112 years. I left the ILX parked for a time and wandered around on foot to explore some of Modena’s streets. It was eerily quiet aside from the crunch of my shoes on the snow. I intentionally kept quiet because I didn’t want to awaken any dogs that might be in the neighborhood. I was able to boost myself up and peek inside the hotel’s main floor. When I visited Modena in 2005, I actually went inside, but given the latest “No Trespassing” signs, I decided to play it safe this time. And a few other buildings within walking distance. 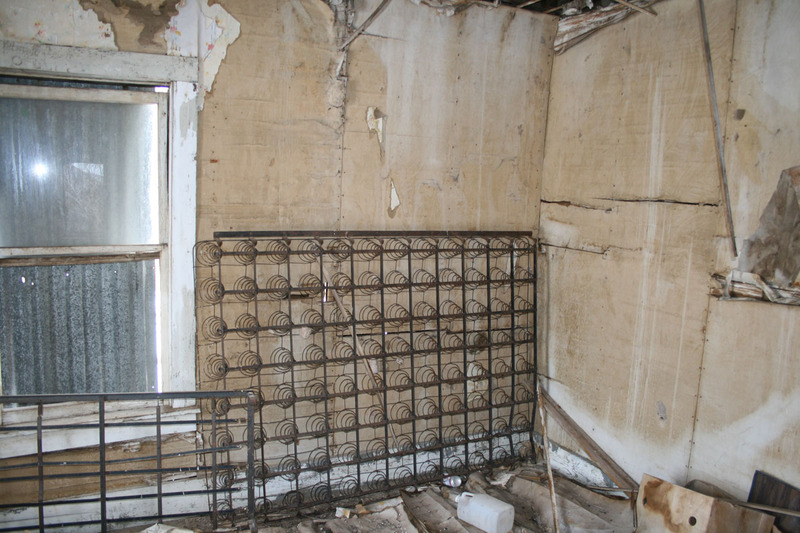 Here’s a shot looking inside the General Store area of the Lund Hotel. I wonder what this place would have looked like in its heyday – bustling with people and commerce as the steam locomotives brought people from near and far. Here’s a fun “then and now” look. 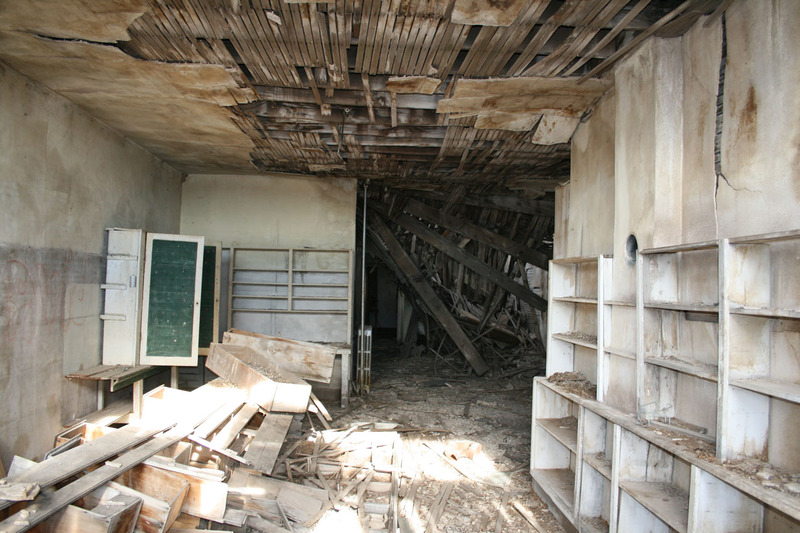 This building was at one time the post office. 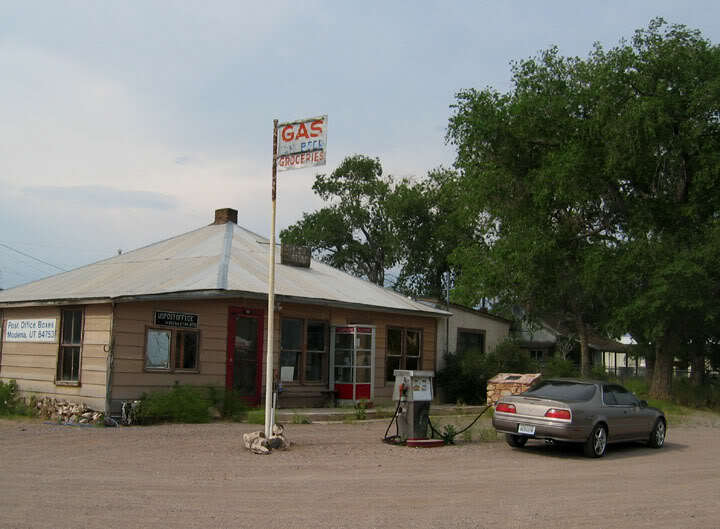 When I visited in 2005, it had a (dry) gas pump out front which has since been removed. Some background information here. 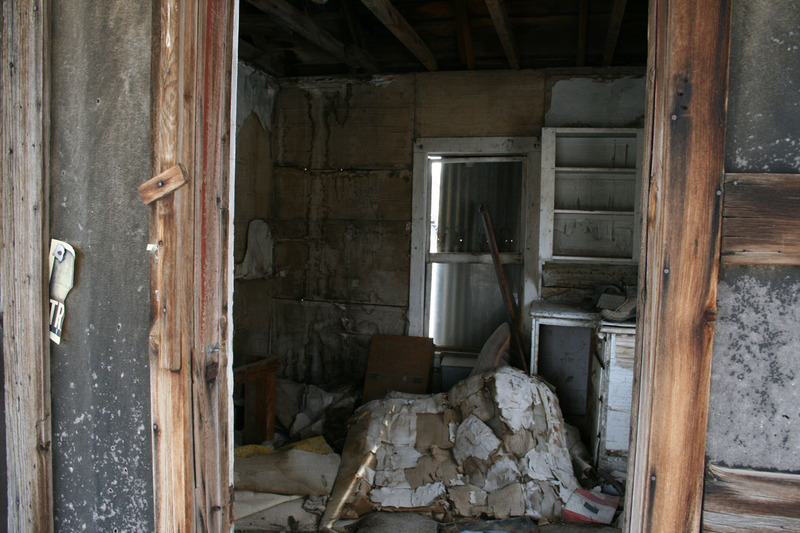 Can you believe this place didn’t have electricity until the 1940’s? 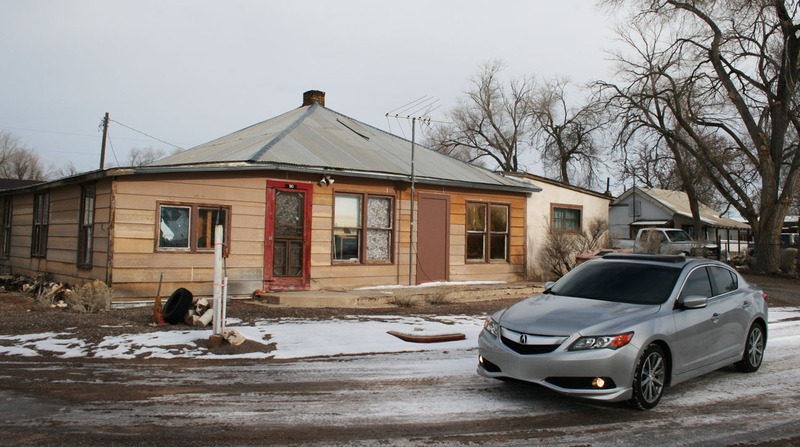 I was intrigued by this little 2-room wooden home. Let’s take a look inside, shall we? Someone left a pair of boots in there. And a stack of newspapers dated 1985. The one on top was dated January 21, 1985. 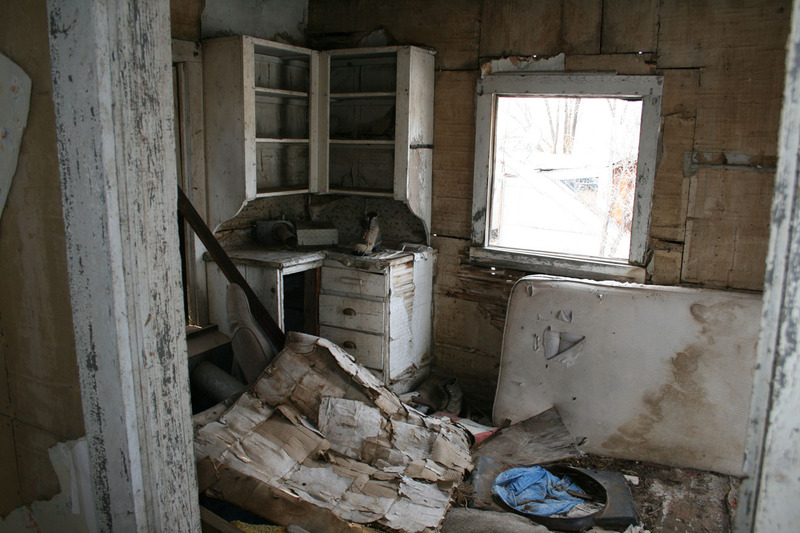 I wonder if someone was still living in this little home 28 years ago. 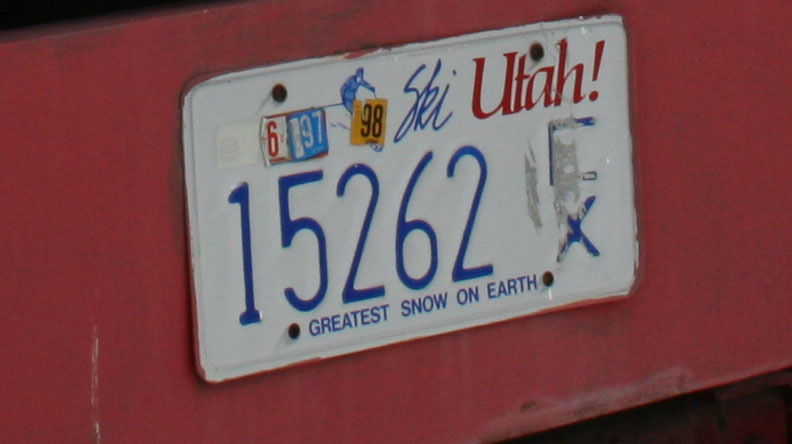 It was last registered in 1998. 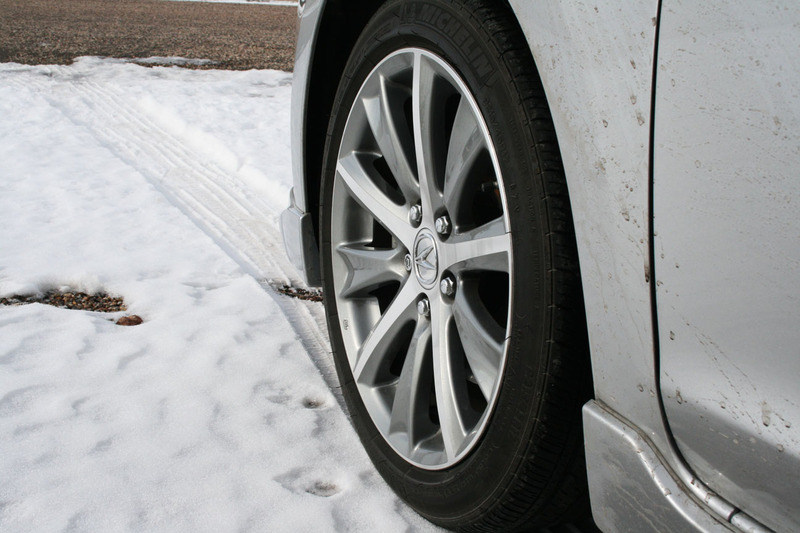 There’s a cool, serene feeling about being the first person to walk or drive on freshly-fallen snow. 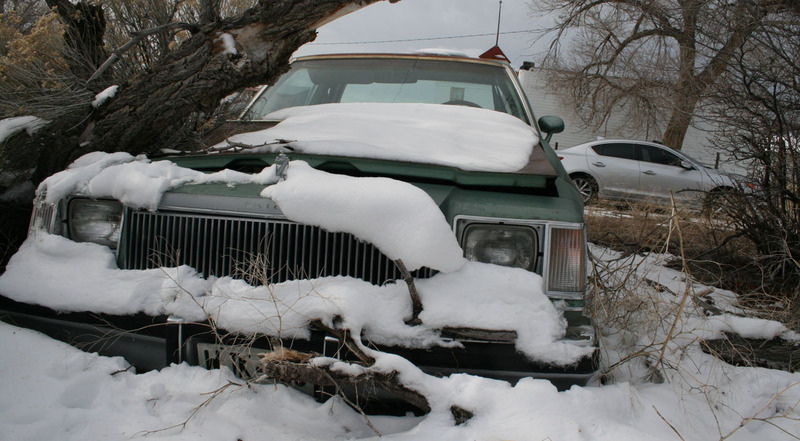 I’m as intrigued by abandoned cars as I am about abandoned buildings. This Buick Regal 2-door caught my eye. The driver’s side door was ajar, so I went ahead and took a look inside. 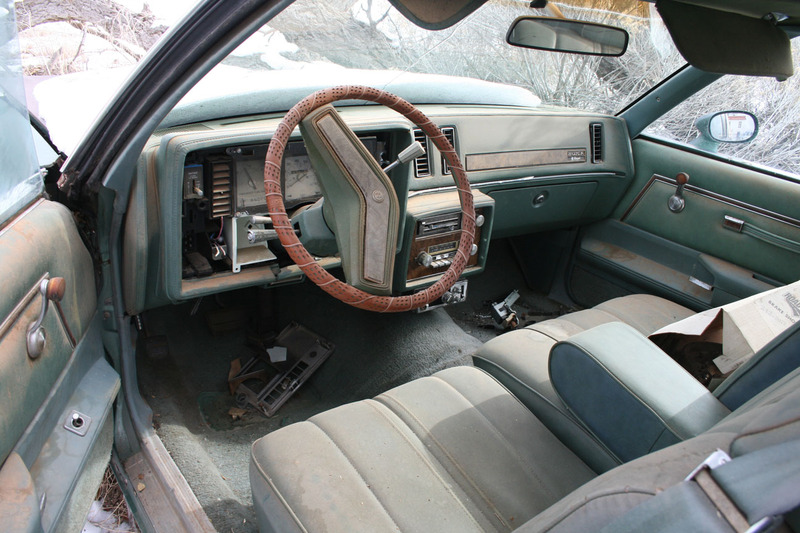 This interior is in pretty remarkable condition aside from the dust. Throw a little vinyl conditioner on those seats and you’d be set! 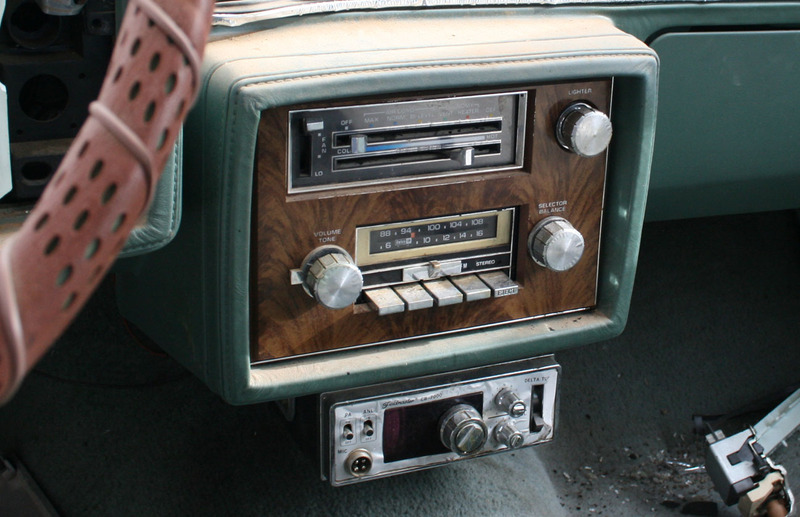 Is that a CB radio I spy? According to the license plate sticker, this car was last registered in 1989. The odometer shows only 75,000 miles. 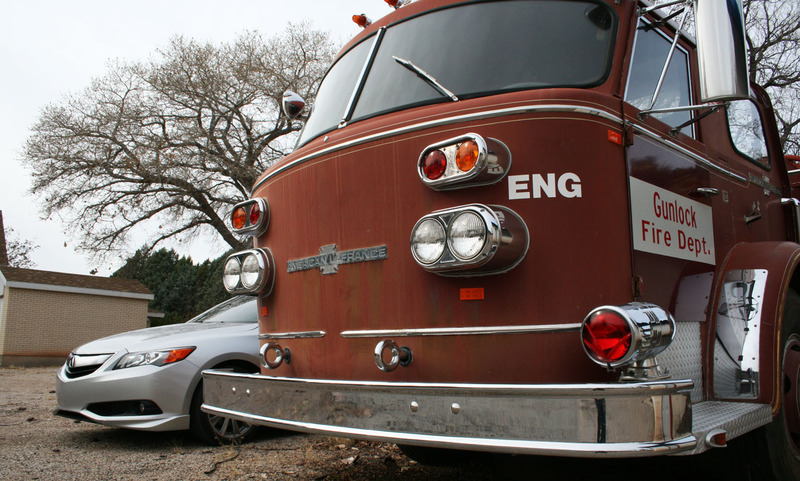 Calling all Drive to Five car geeks. 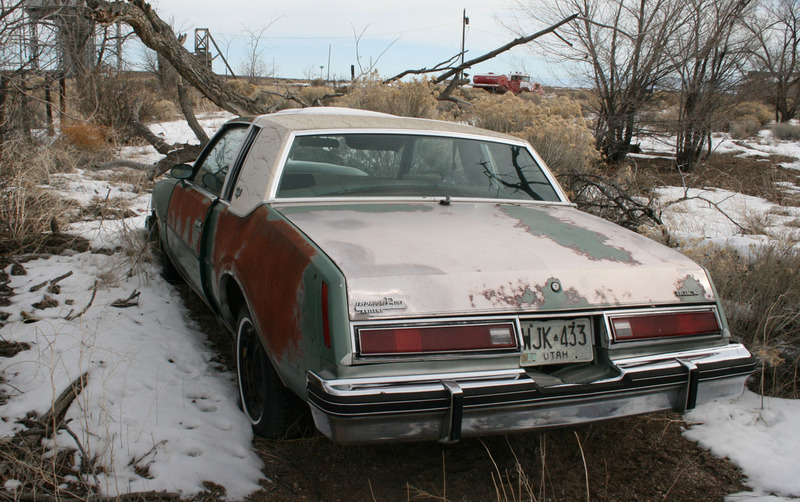 Can anyone identify the year of this Buick? Now’s when I really started getting a sense of adventure. 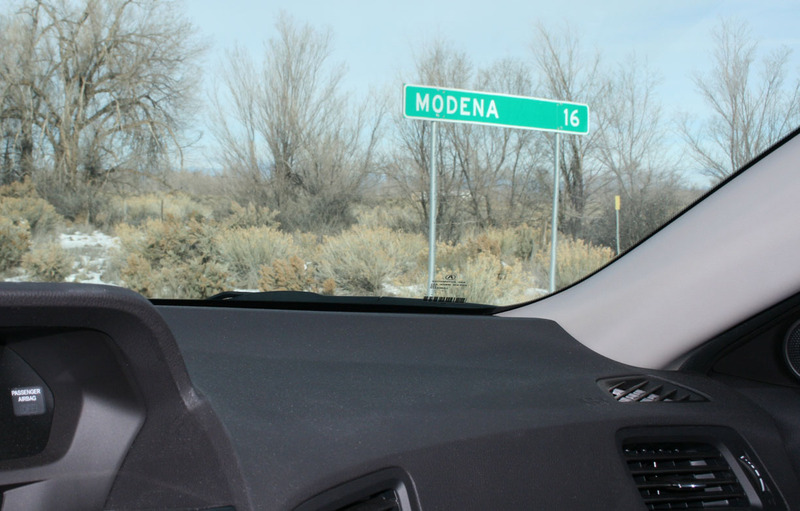 I drove past a road called “Old Modena” road. I thought I’d give it a quick drive to see what was down there. Except, this road quickly turned to dirt. 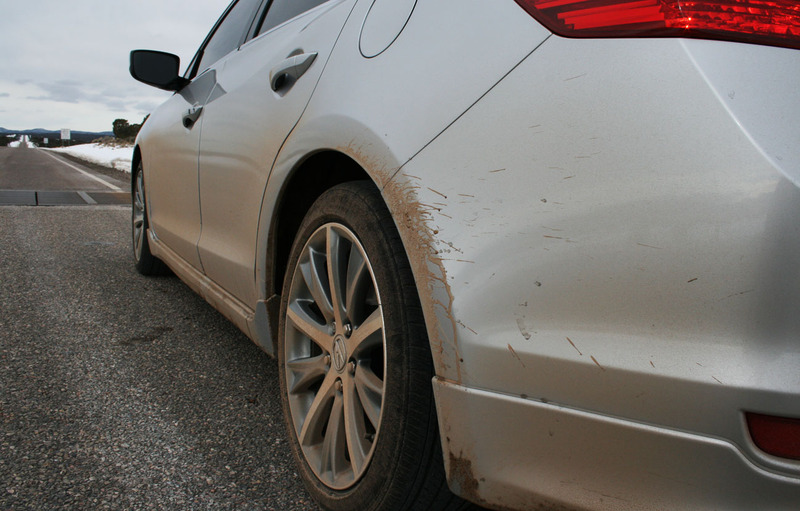 Well — make that mud. 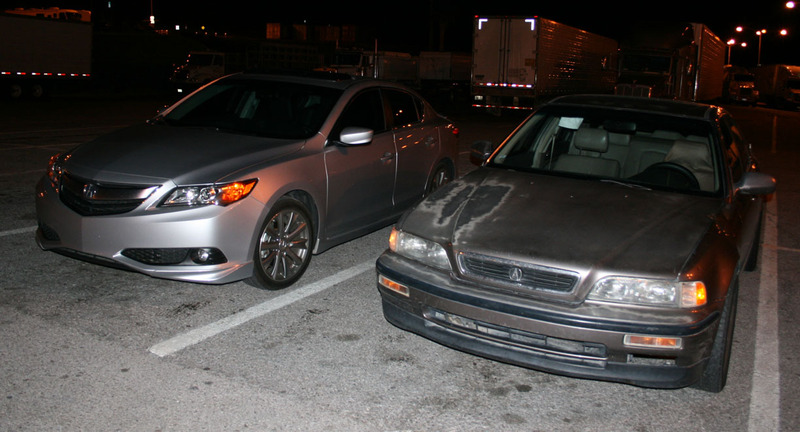 So much for my clean ILX. Just a couple of miles down the road, conditions got quite a bit worse or I would have continued. 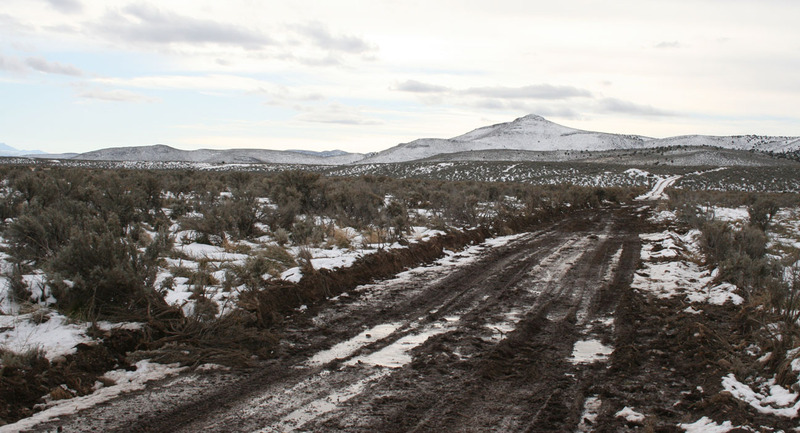 The last thing I needed in this remote area was to get my car stuck. 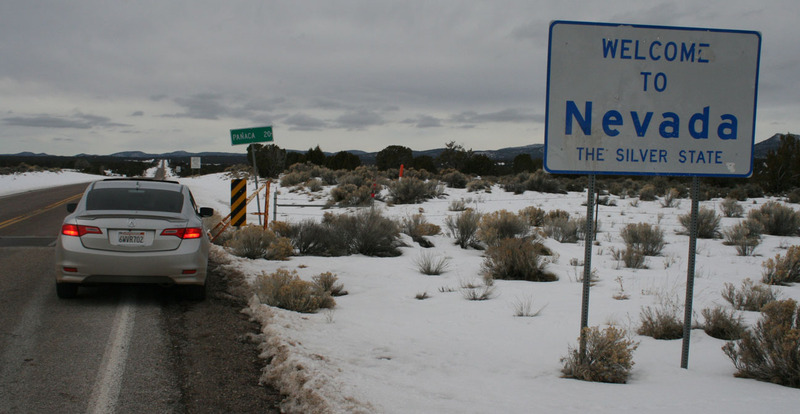 I took the 9-mile drive to the Nevada state line. Looks like I’m due for a car wash.
Looping back, I’d been thinking about those famous Veyo pies the whole time, so I grabbed a peach pie. From there I took a new route home by heading west on Center Street. 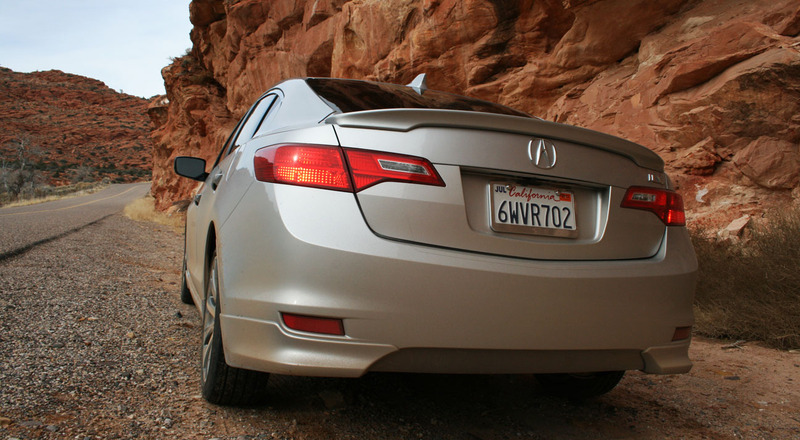 The 2-lane highway curved through some 15-25 mph turns which were fun in the ILX. Since this was a new stretch of road for me, it seemed fitting that this song came on my iPod. I really enjoy this one from Linkin Park and I played it 3 times back-to-back. 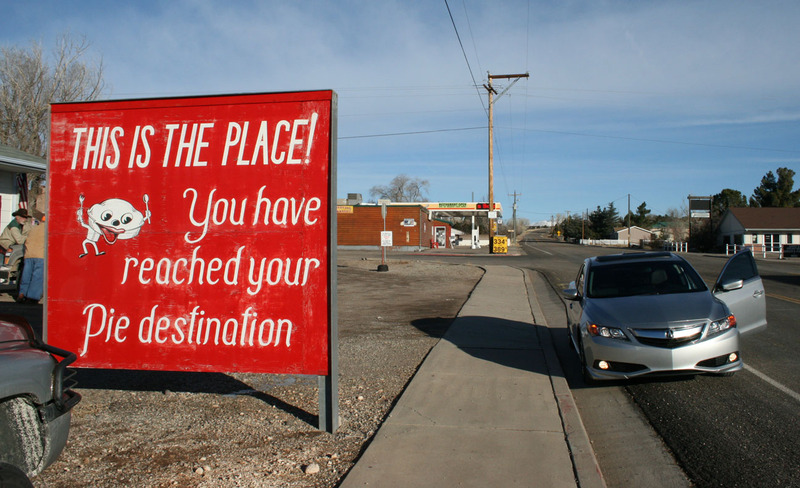 Soon I was rolling through Gunlock, Utah. 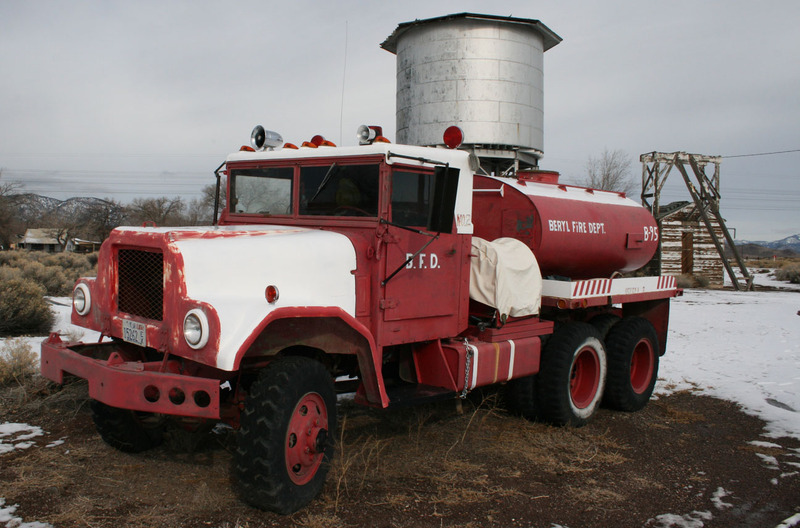 Gunlock’s fire engine looked to be in only slightly better condition than the one in Modena. 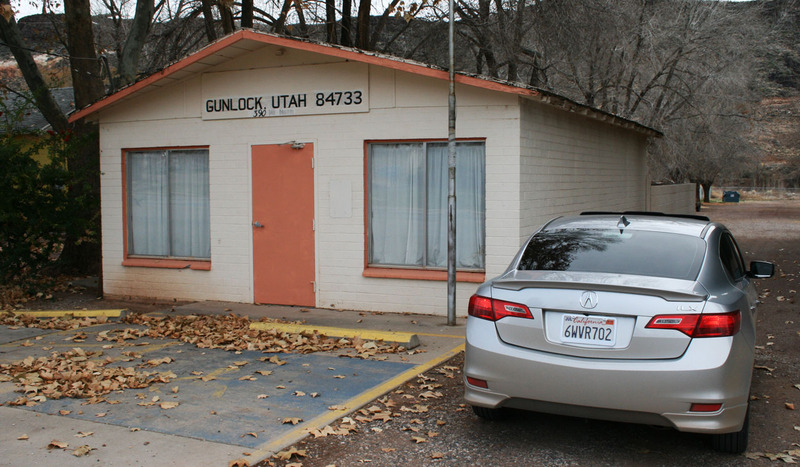 Gunlock is home to fewer than 300 people. 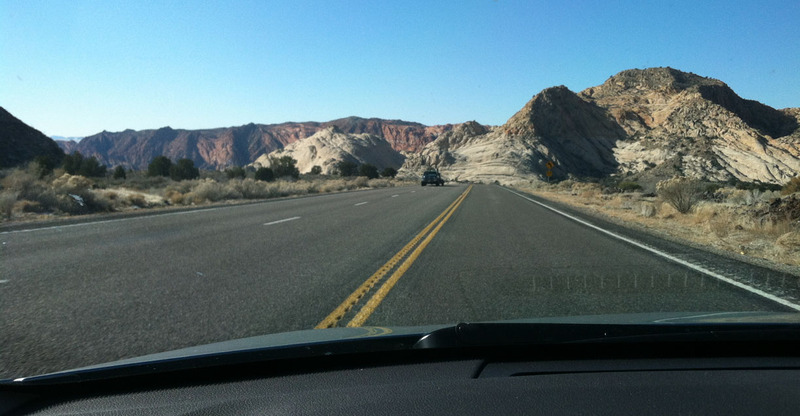 And now at the lower elevations, the beautiful red rocks of southern Utah lined the road. That peach pie was amazing, by the way! Today’s final trip of the weekend was 453 miles. 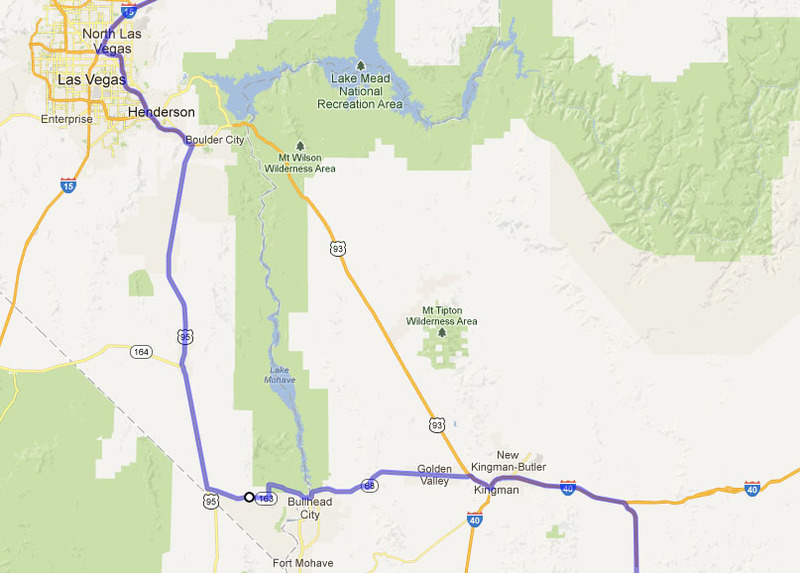 Instead of taking the same ol’ route past Hoover Dam and down Hwy 93, I instead cut south at Boulder City on Hwy 95. This is an arrow-straight multi-lane highway named Veterans’ Memorial Highway. A series of signs along the roadside at certain intervals denote which veterans are to be remembered (there’s a sign for WWII, Vietnam, and others. I remember noticing that the last sign said something to the effect of, “Veterans of the continual war on terror”). But first, I had something to see in Las Vegas. Some of my readers may remember a cartoon called The Simpsons. 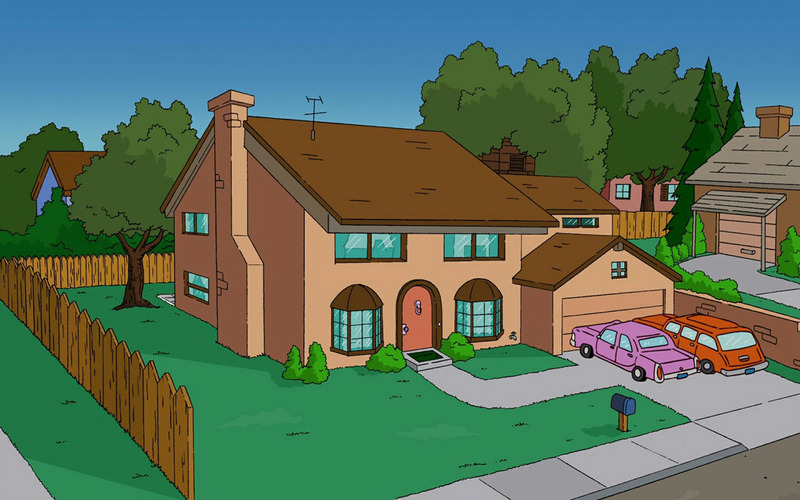 Well, thanks to Roadside America, I learned that there is in fact a home in the Henderson suburbs that was built after the design of the cartoon home in 1997. 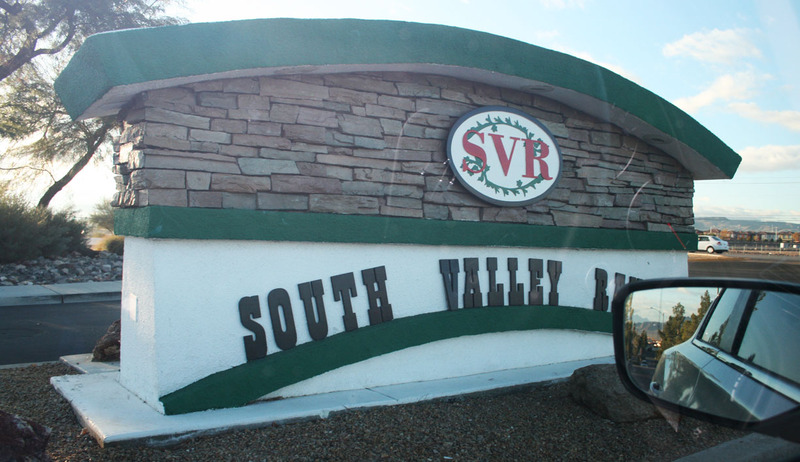 It’s in the South Valley Ranch community off Boulder Highway. Check it out! And disregard the filthy car, please! Pretty fun. I wonder how many people drive by it each day for a picture. Here’s where I veered off US93 and took the 95 southbound. 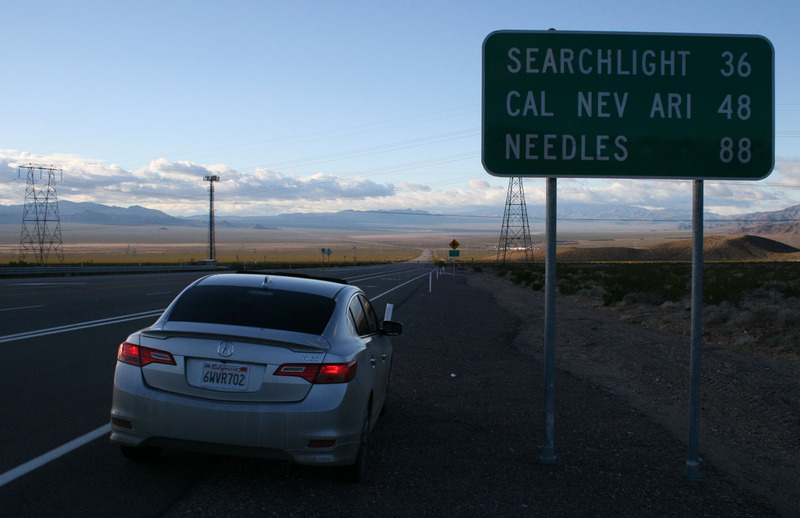 “Cal Nev Ari” (noted on the sign) is a 400-person community at an intersection of California, Nevada, and Arizona. Lots of vast open land out here! 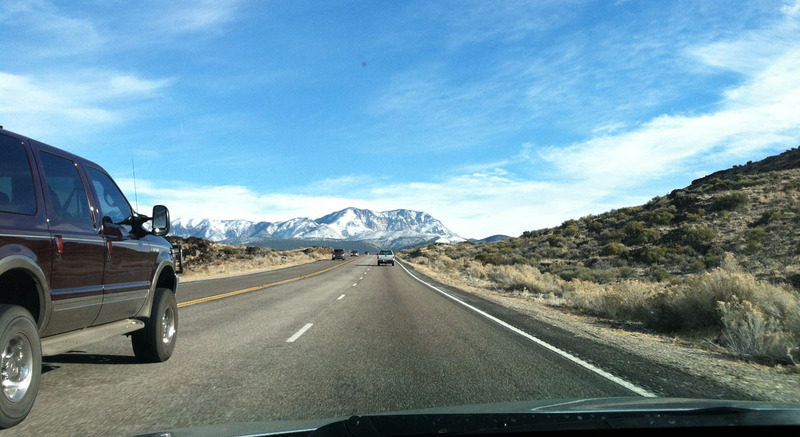 The speed limit dipped quickly to 25 mph as I rolled through Searchlight, Nevada. This town is so teeny I couldn’t even find anything worthy of a photo-op. 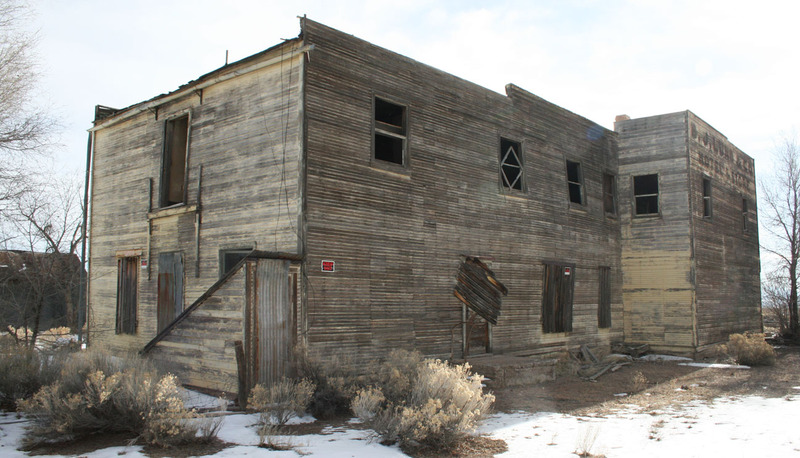 Amazingly, at one time this was a boom town that had a population greater than Las Vegas. 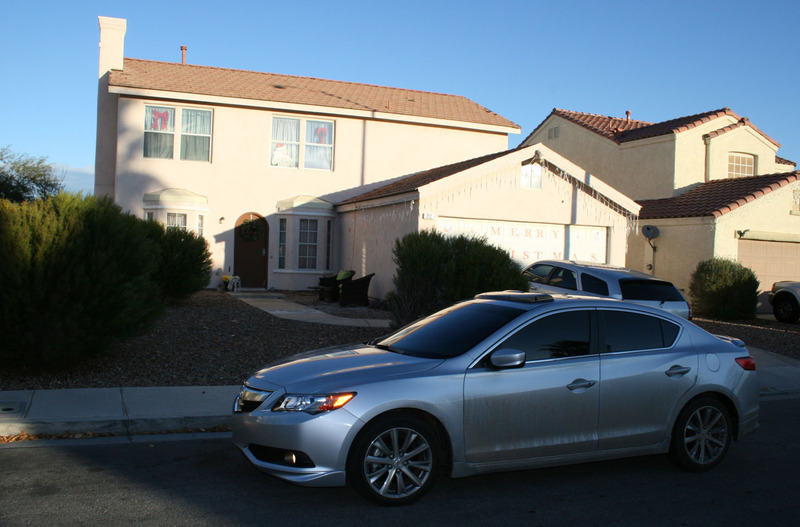 Today, there are fewer than 600 residents. 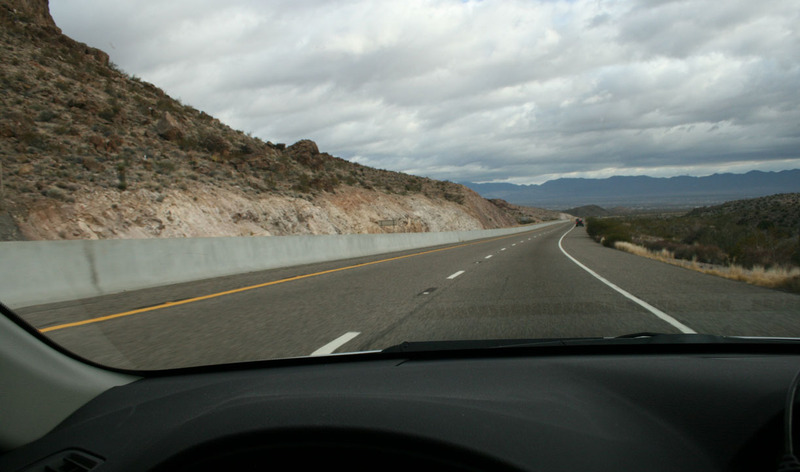 When I approached Hwy 163, I headed toward Laughlin Nevada. 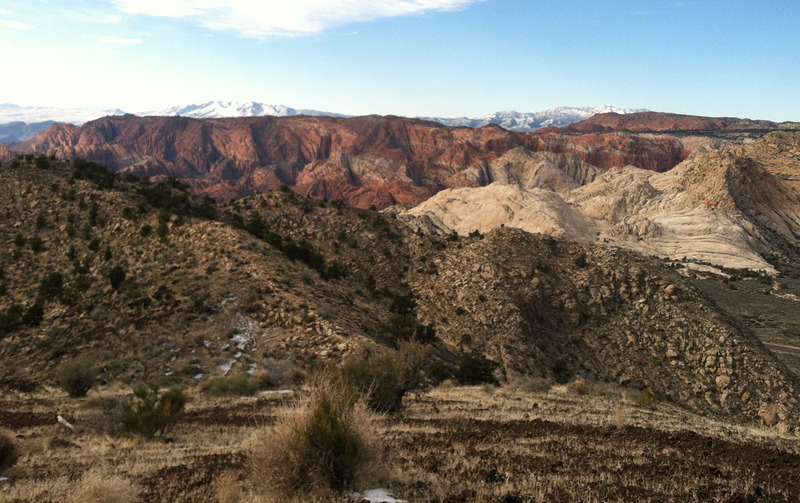 The road drops sharply in elevation toward the Colorado River in the valley below. Laughlin is the third most visited casino and resort destination, after Las Vegas and Reno. 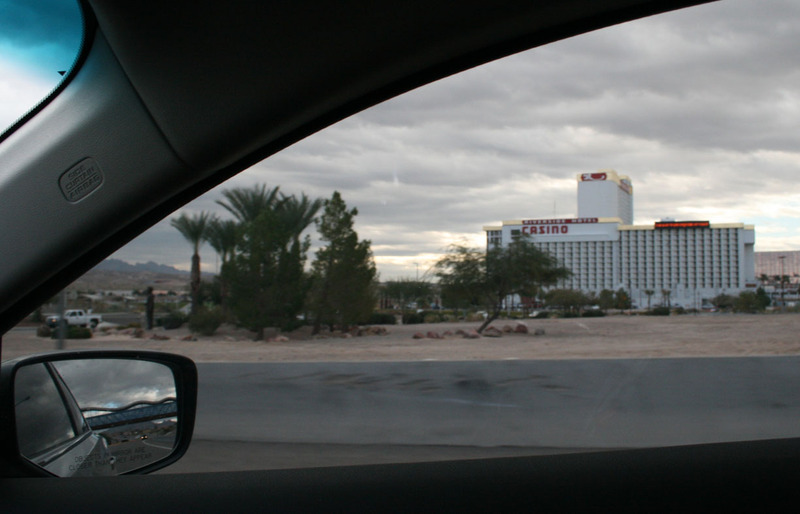 I did not pit stop here but did snag a picture of the Riverview Casino out my passenger window. 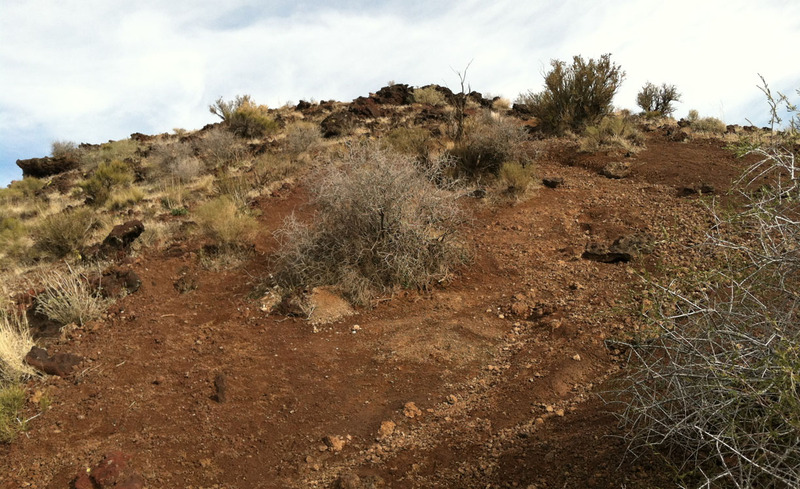 The road climbs from the riverbed up to another pass and then on through Kingman. And 3 hours later I was home sweet home in Scottsdale. I’m exhausted from these travels and looking forward to spending the evening relaxing with friends. Hope everyone has a safe and happy Christmas tomorrow. 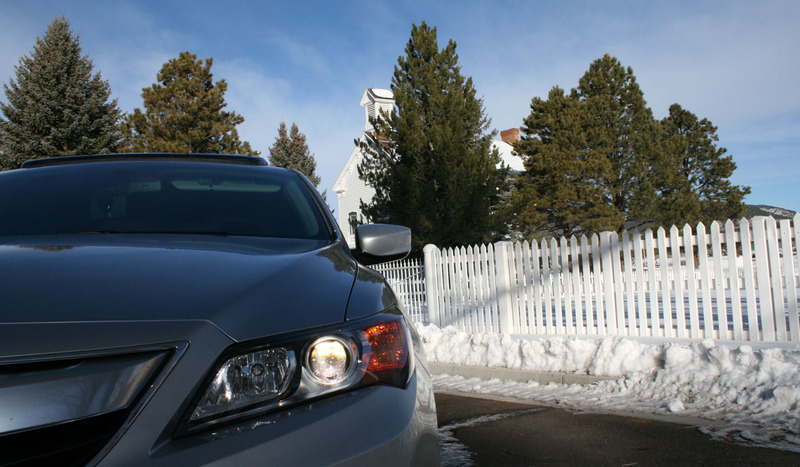 This entry was posted on December 24, 2012 at 2:27 pm and is filed under Ghost Town, ILX, Road Trip, Utah. You can follow any responses to this entry through the RSS 2.0 feed. You can leave a response, or trackback from your own site. Have a great Christmas Tyson! And the same to you, Terry! Thank you friend. Incredible journey, Ty! I live vicariously thru your continued adventures. Thanks Barry! This was a really fun weekend. Glad you could enjoy coming along for the ride. Hope you had a great Christmas and I’ll that get to see ya soon! Take care. 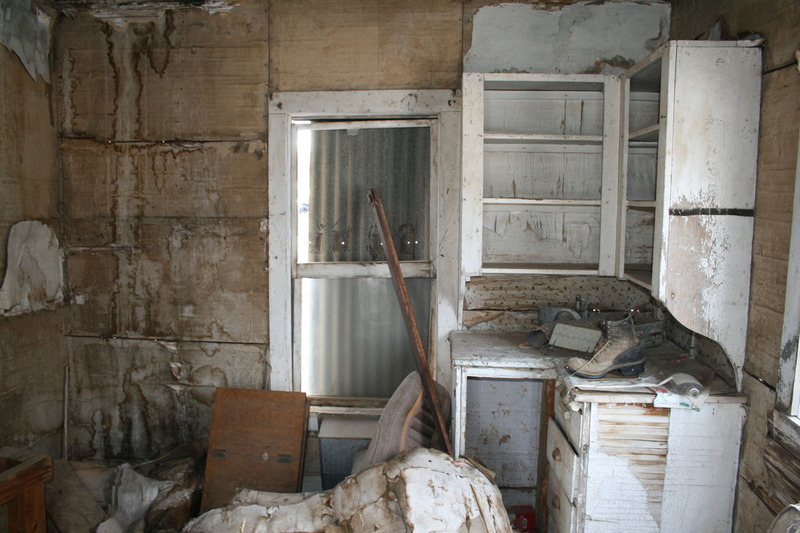 I love ghost towns it is like traveling back in time, it really stimulates your imagination. I agree – love going to places like that and stepping back in time. I would have loved to visit when the town was in its prime. 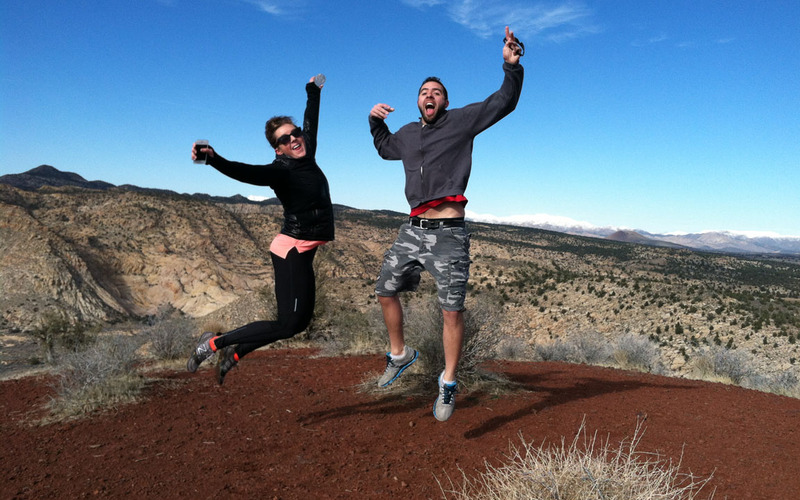 There’s a whole list of similar places in Arizona that I’m hoping to visit. 2013 will be a busy year! So many good details in this post! I guess I could say I can relate to so much of it — because I was there for much of it! I will be downloading that song from Linkin Park. And that sign with 3’s on it had my name all over it! 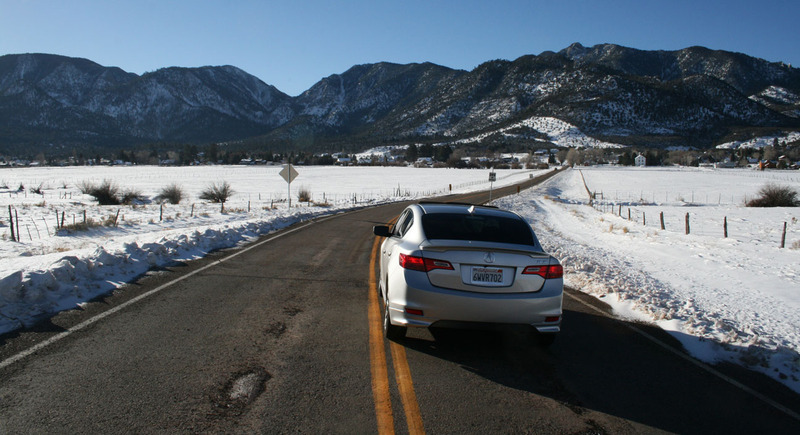 Here’s to roads untraveled — bring on 2013!! That Linkin Park song is a good one for sure! If you hear any other “road” related songs, do send them my way! Remember when Amber put together the Drive to Five music playlist? That was awesome! WOW!! 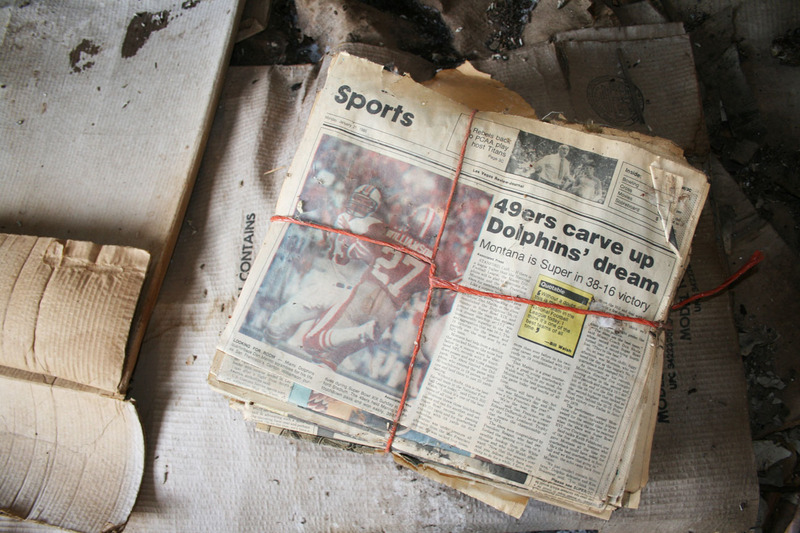 Of all the newspapers that could have been inside that cabin in far away Utah, it is a newspaper depicting Miami Dolphin Dan Marino’s only Super Bowl appearance and loss. I live in MIami and lived here when Dan “The Man” Marino played this game. I even went to the playoff games immediately preceding this game. Living in Miami at the time was incredible. Everyone loved the Dolphins. And that front page of the paper in your picture looks remarkably well preserved for it being a 28 year old paper exposed to the elements. It is like you traveled back in time! 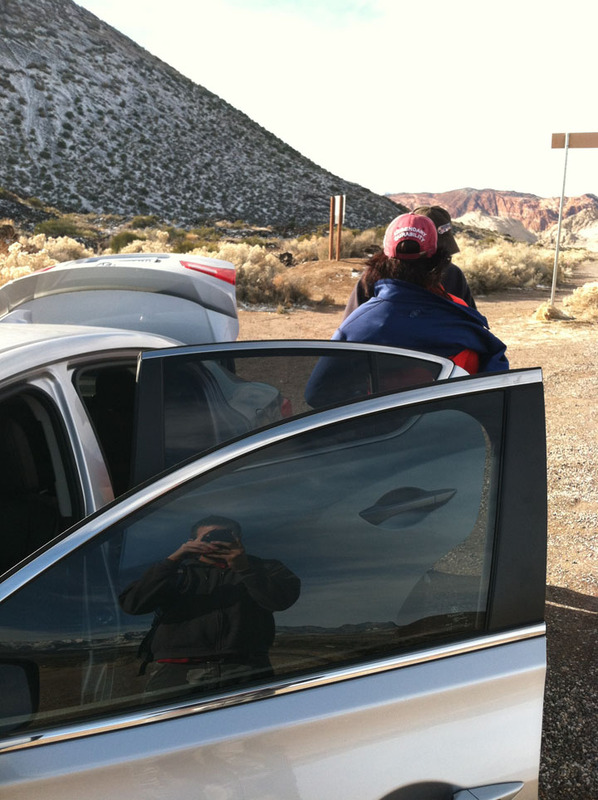 Like you went thru a space time continium while traveling in a little town in UTAH!. (I hope you are a Star Trek fan to appreciate that last comment). Happy Holidays Tyson. 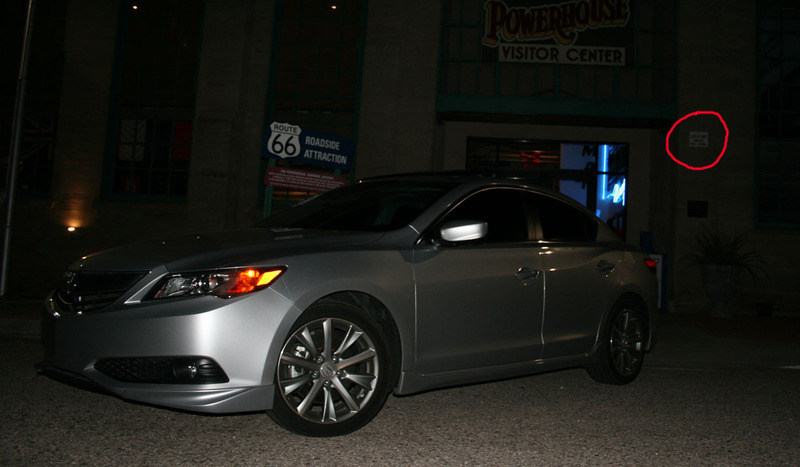 Carlos, that’s some awesome background! It’s totally ironic then that I picked up that particular stack of papers. There were at least 3-4 other bundles up stacks. Interestingly enough I had another reader email me a similar story to yours – he was living in SF at the time of that Superbowl game, and seeing the newspaper brought back memories for him. Hoping to take another trip through a space time continuum soon! Happy new year Carlos! You need to get Beryl on a trip to Beryl! How random. 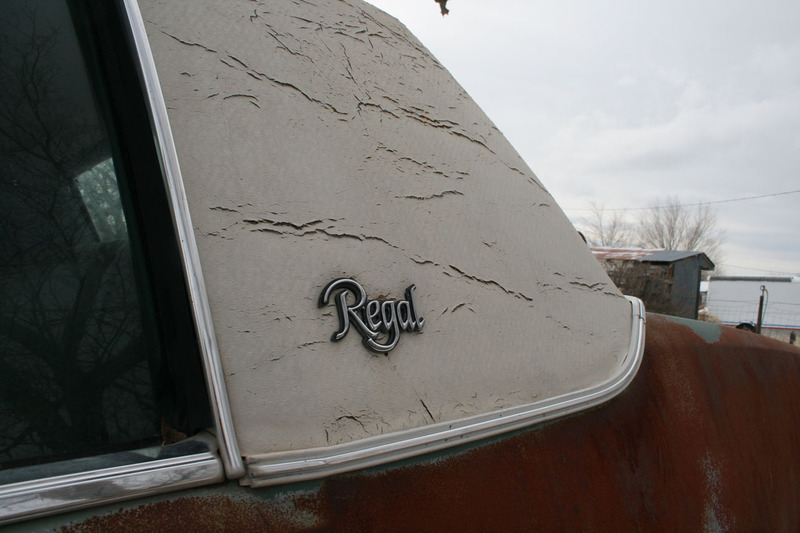 Wayne in Houston identified the Regal. It’s a 1978 or 1989. He had a 1980 Limited with T-tops & leather. I knew someone would be able to figure it out! Make that “1979”, not 1989.